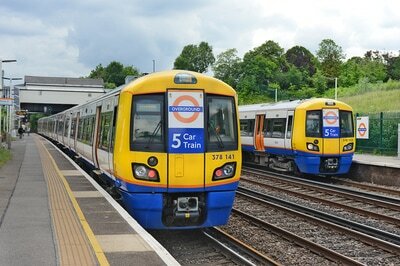 59002 up Lewisham, 11.20 Allington ARC to Whatley Quarry (empties). 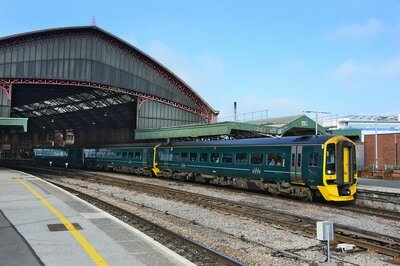 31May 2017. 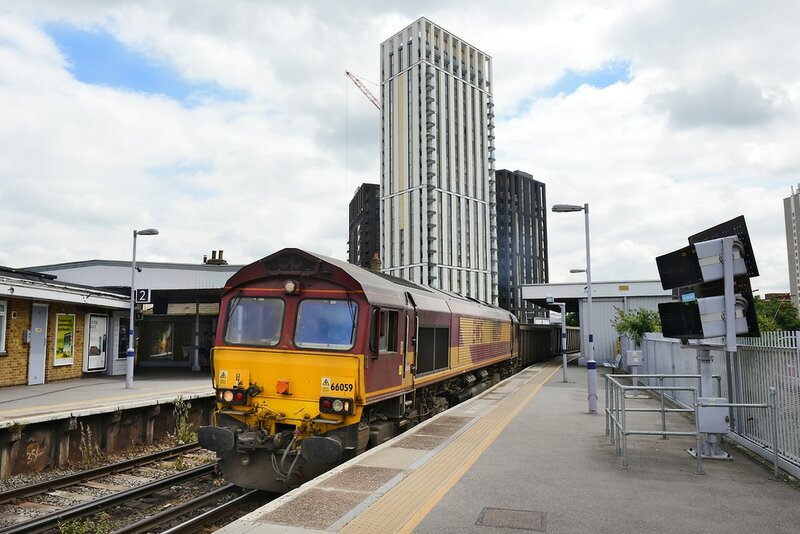 66059 pass Lewisham, 11.09 East Peckham Tip - Southall. 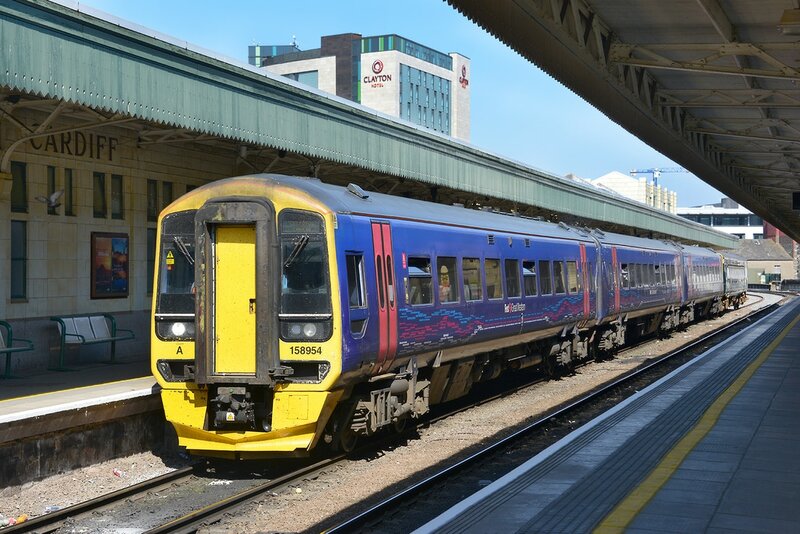 31 May 2017. 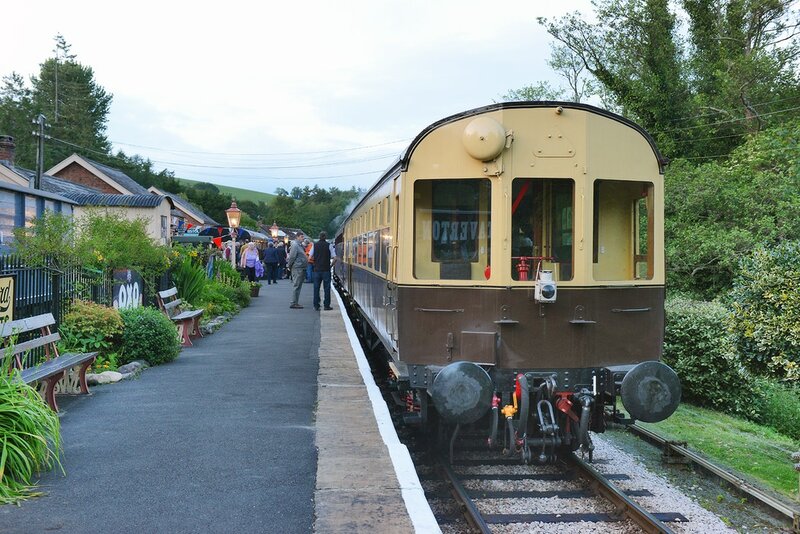 D7612 and D6975 stabled at Buckfastleigh, 30 May 2017. South Devon Railway 2-6-2T No. 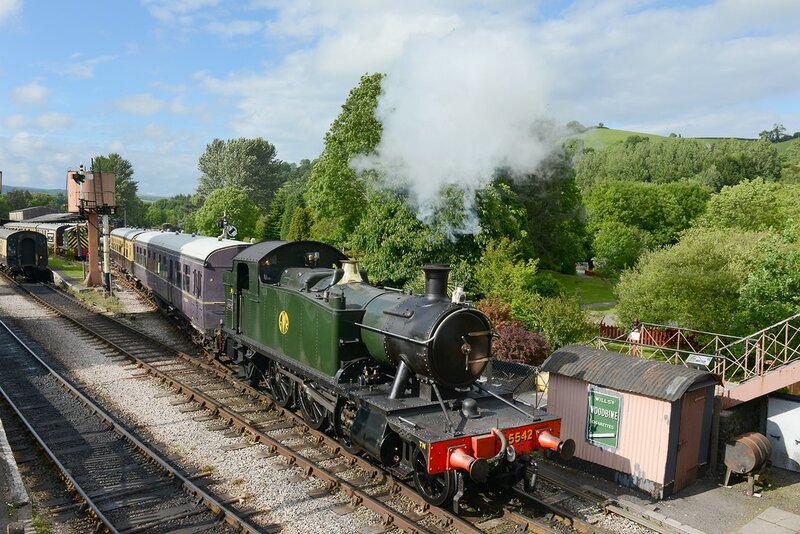 5542 shunts the lines two operational Great Western Auto Trailers at Buckfastleigh on 30 May 2017, prior to operating Bernard Mills 'Birthday Bash' to Totnes and return. 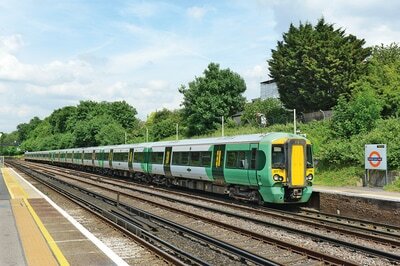 DB-S Class 59/2 No. 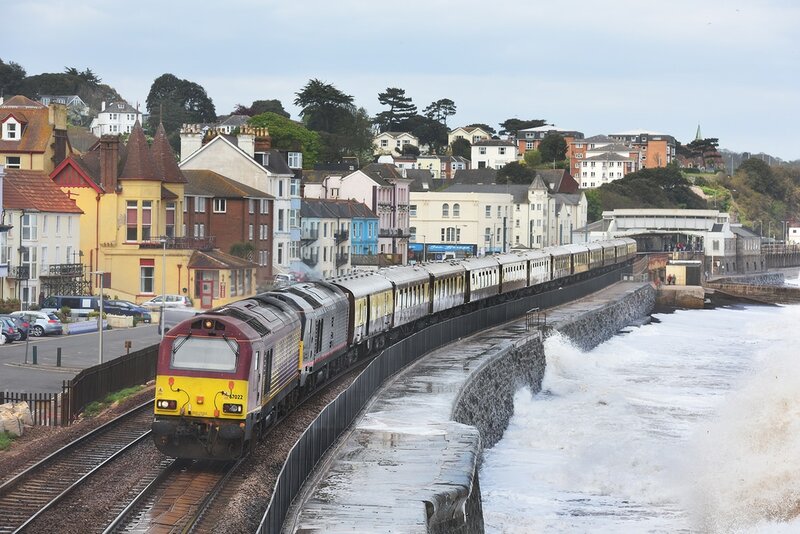 59202 emerges from Kennaway Tunnel, Dawlish at dusk on 29 May 2017 powering the return 'The Cornishman' charter, 1Z65, 17.15 Penzance to Paddington. 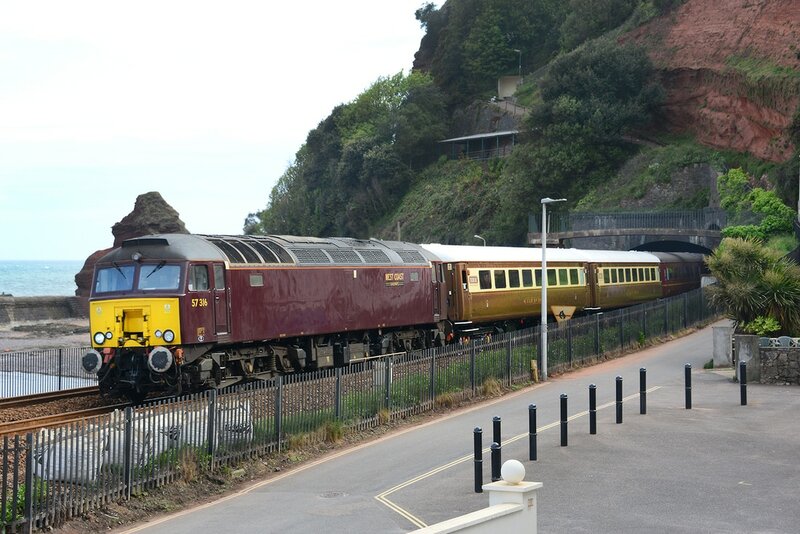 Sod 'Tornado' on 'The Cornishman' this is way better, a wrong line westbound 59/2 at Dawlish with a support coach. 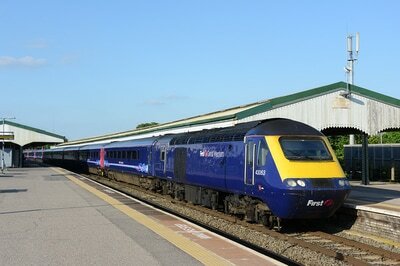 Running as 5Z60, the 11.50 Exeter Riverside to Penzance, No. 59202 plus coach 21269 skirts Marine Parade running down the up line. 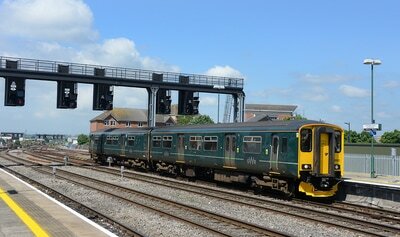 Is this the first '59' to run wrong line through Dawlish (excluding worksite trains)? 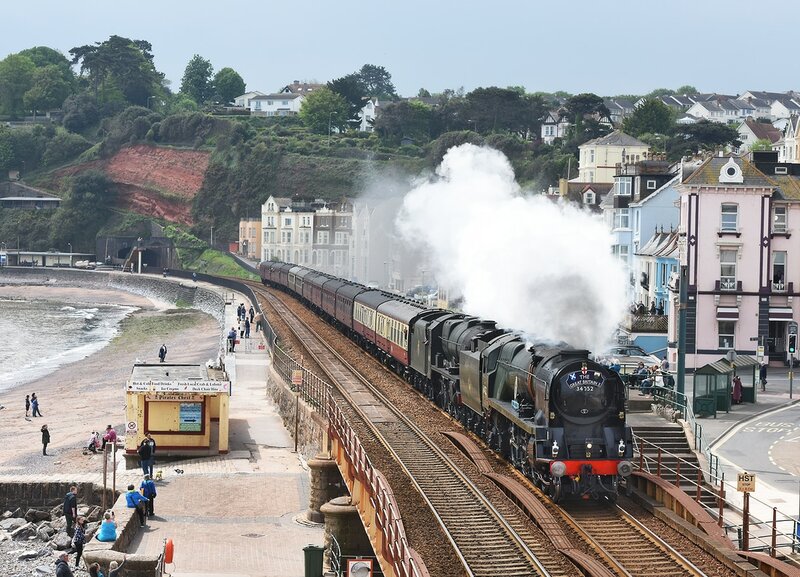 Tornado heads west through Dawlish on 29 May 2017 powering 'The Cornishman', 1Z63, 08.03 Paddington to Penzance. 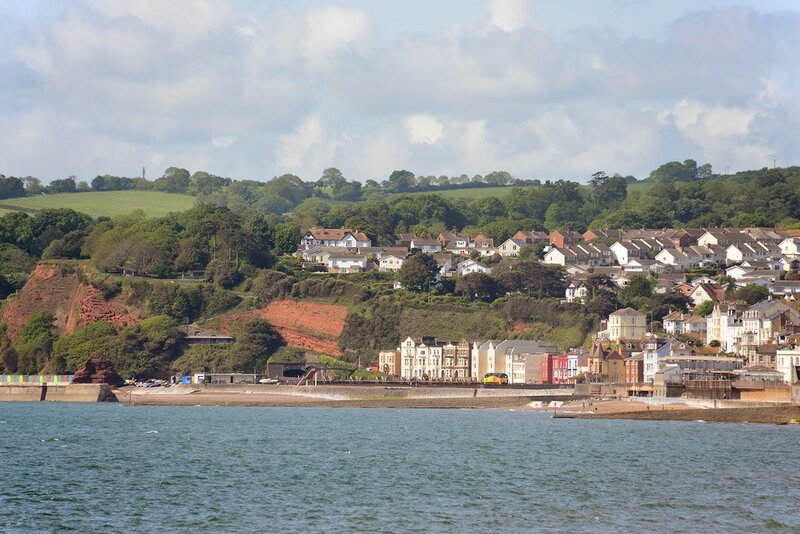 Perfect crap weather in the seaside town. 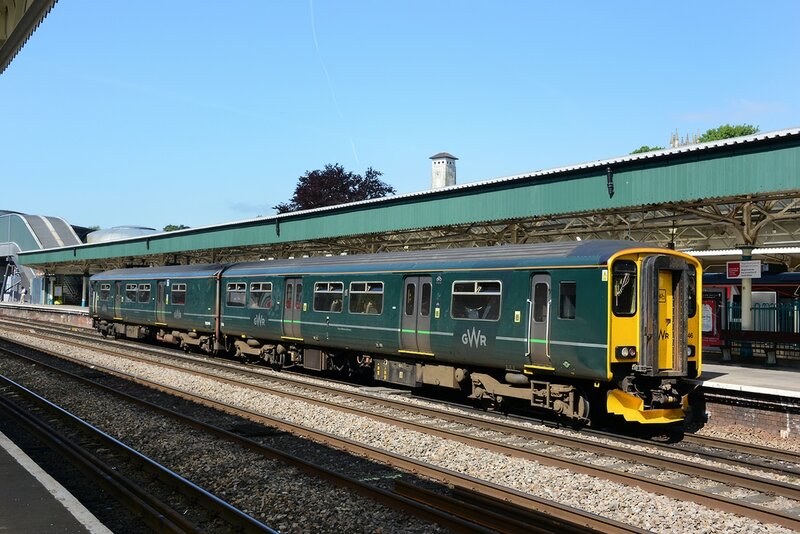 Although it is likely to be its last year of operation, 2017 again sees Great Western Railway deploying the Class 57 and day saloons off the Night Riviera service on a summer Saturday duty. 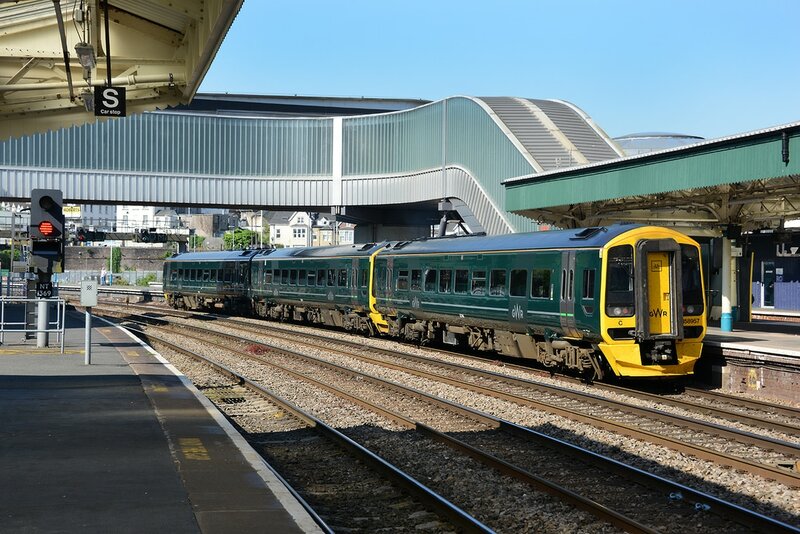 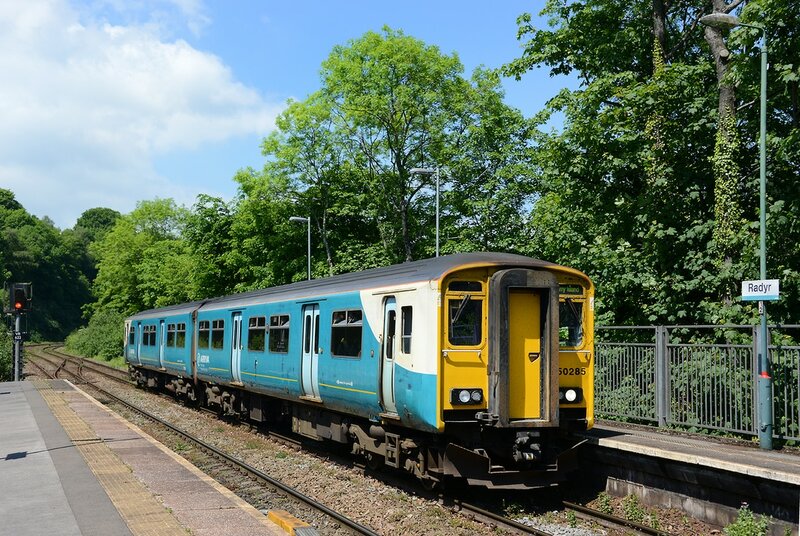 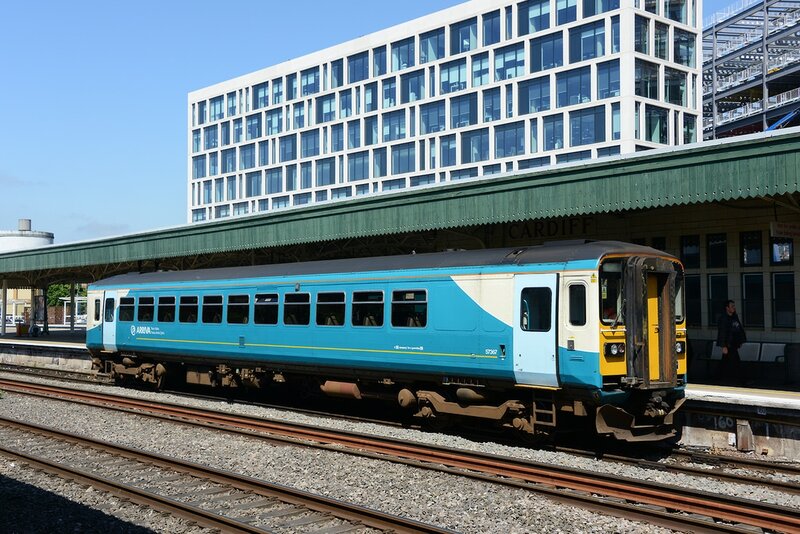 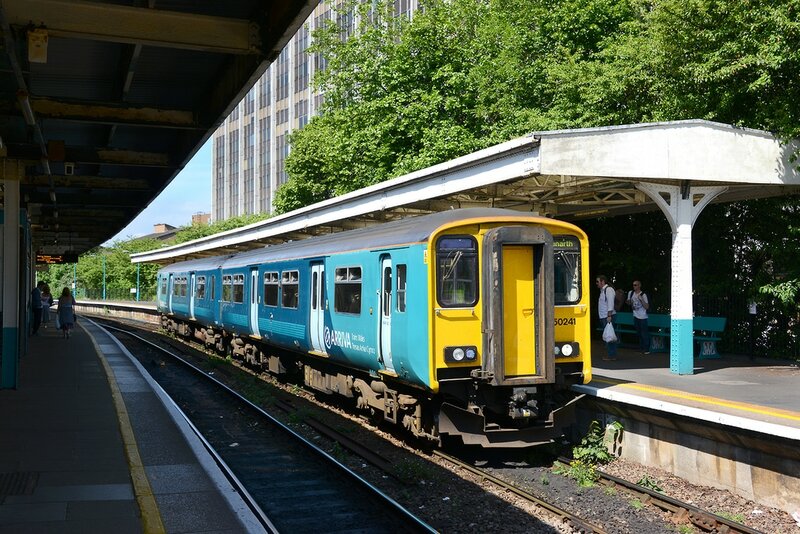 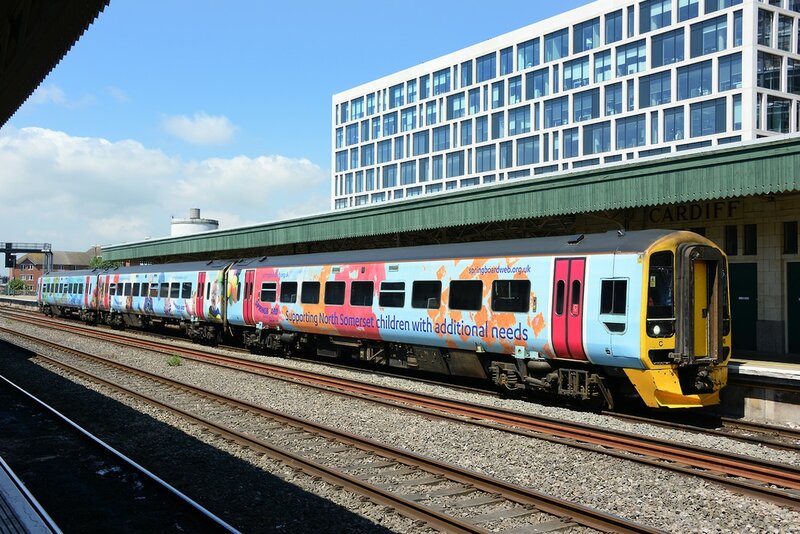 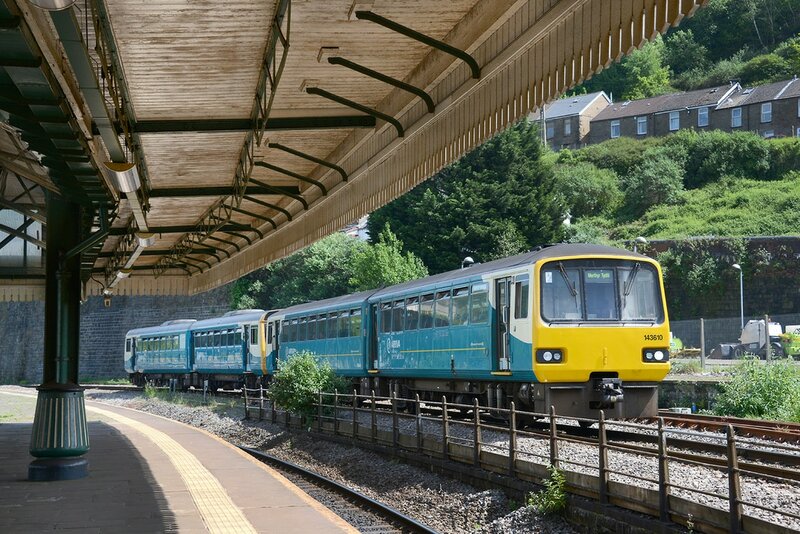 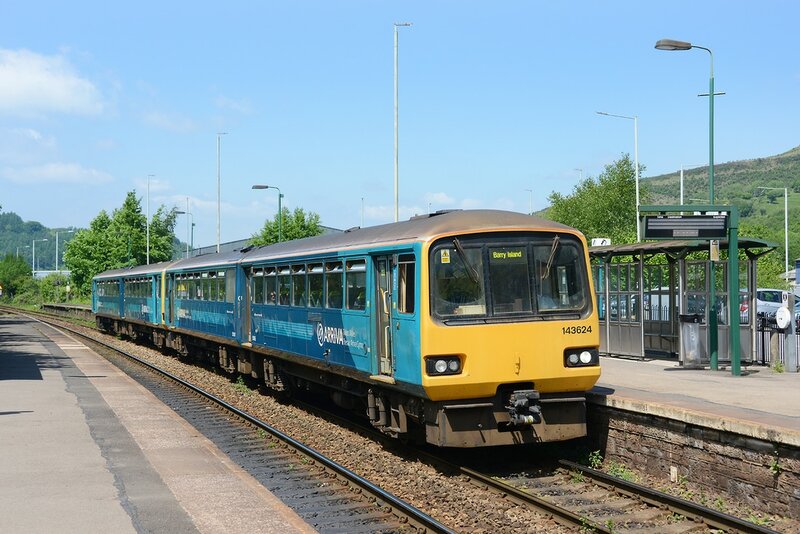 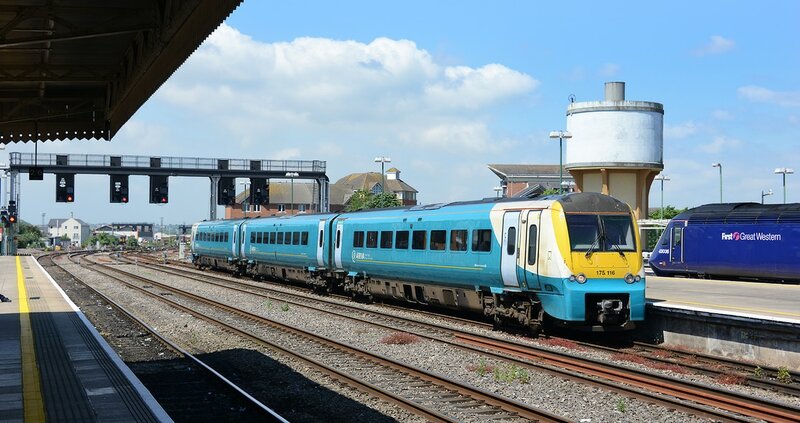 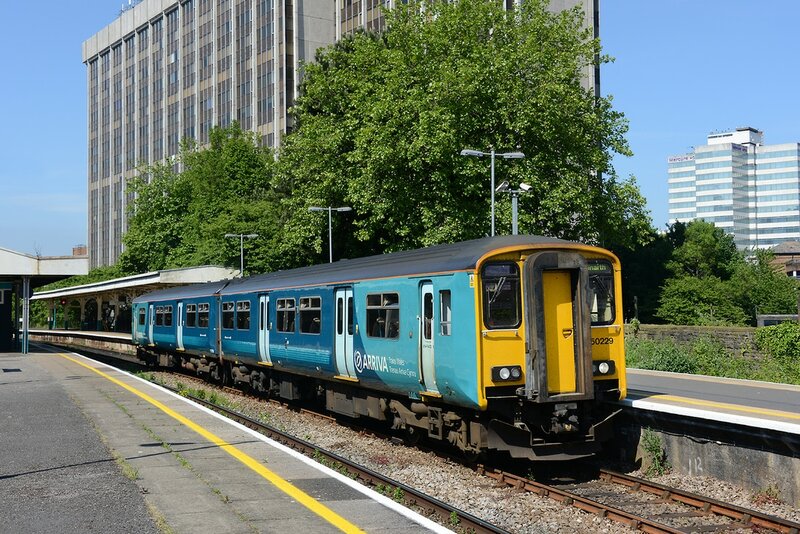 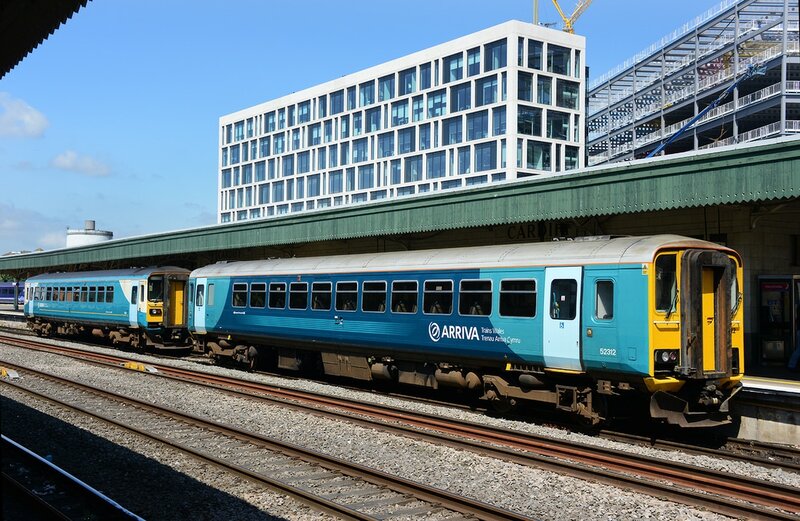 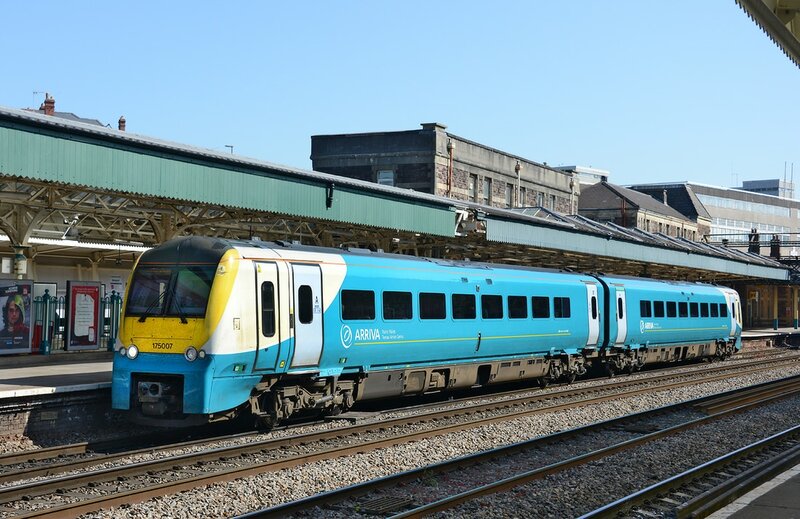 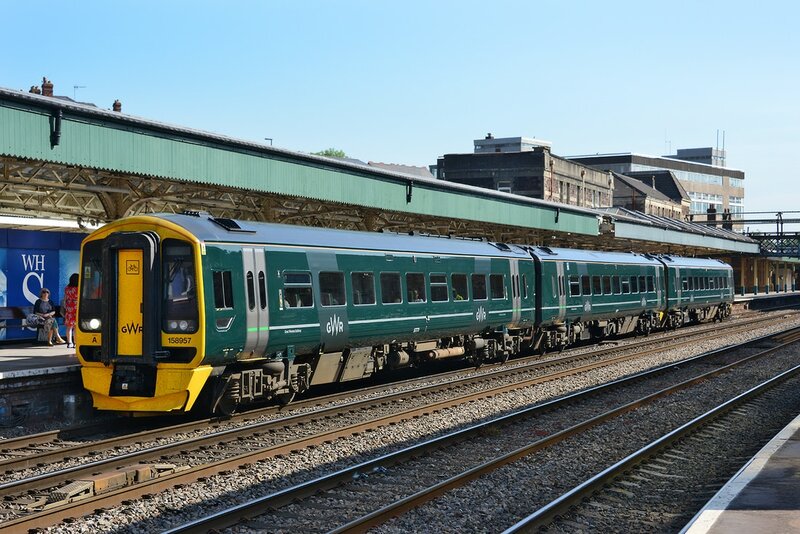 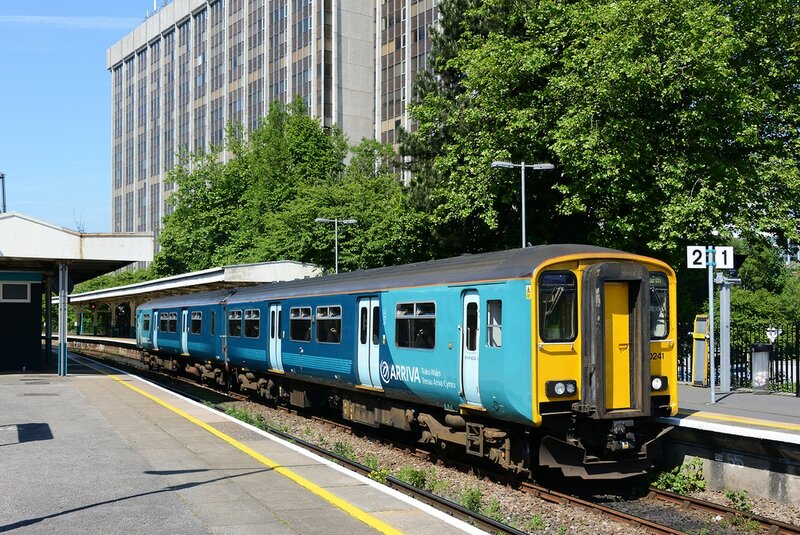 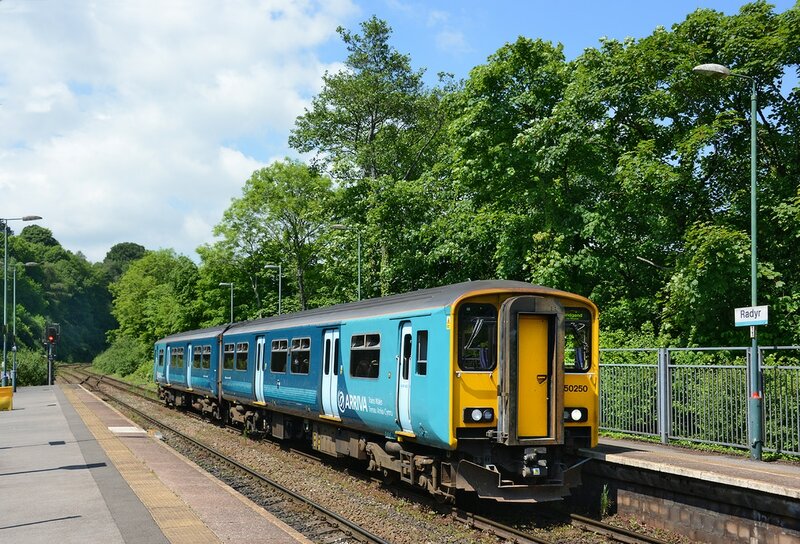 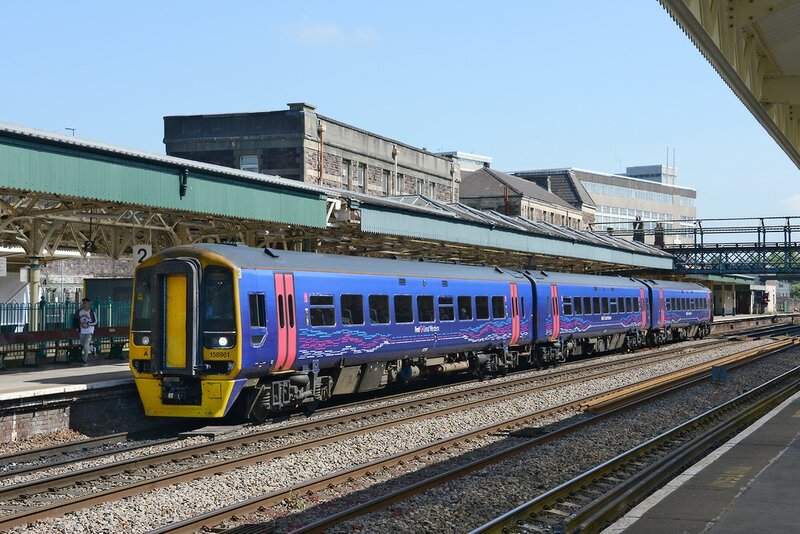 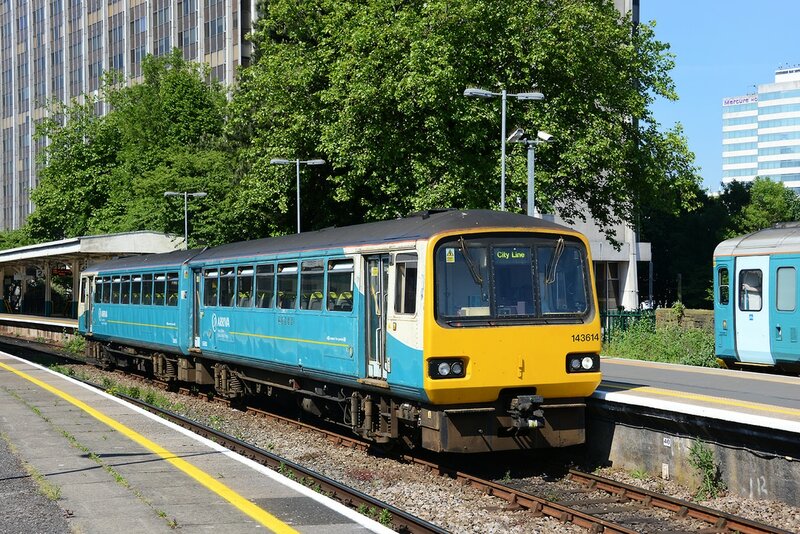 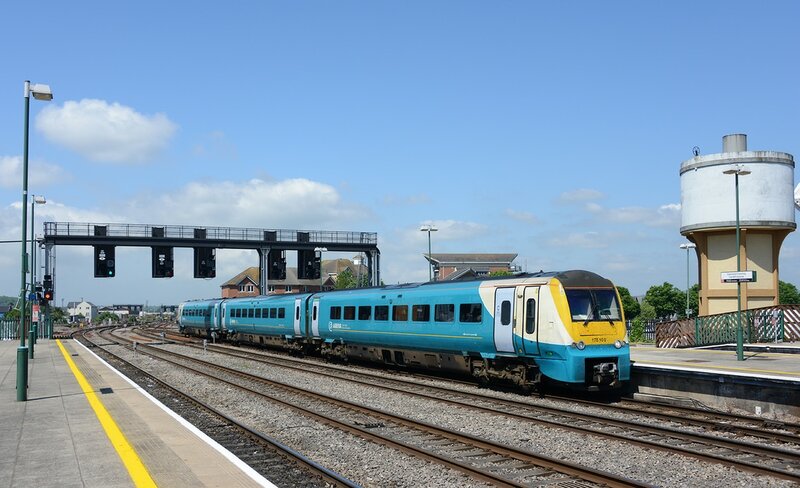 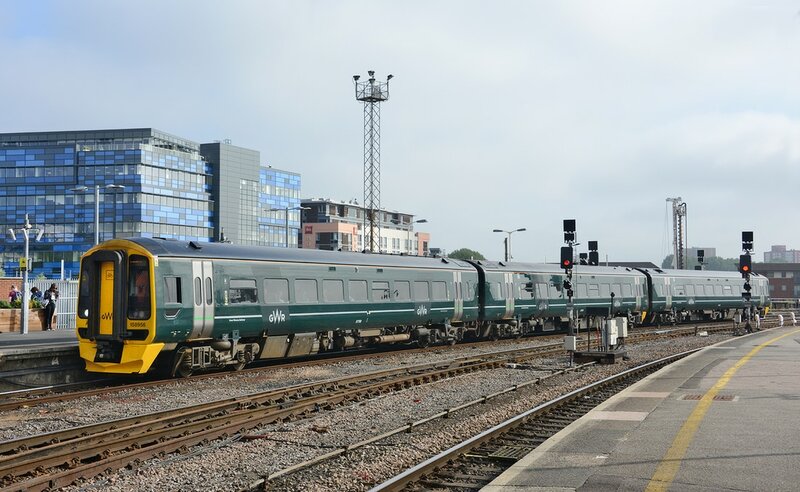 This year the loco hauled set operates the 10.28 St Erth to Plymouth, 13.35 Plymouth to Exeter St Davids and the 17.50 Exeter St Davids to Penzance. 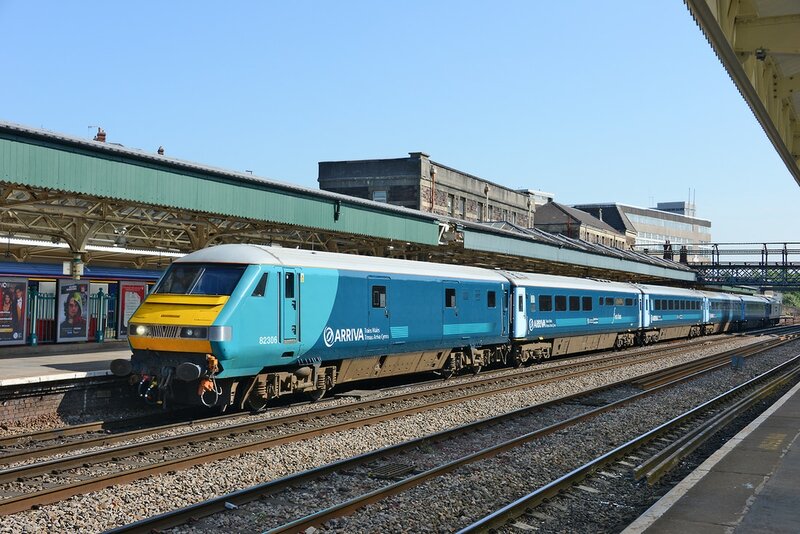 The loco hauled services will operate from 27 May to 9 September 2017. 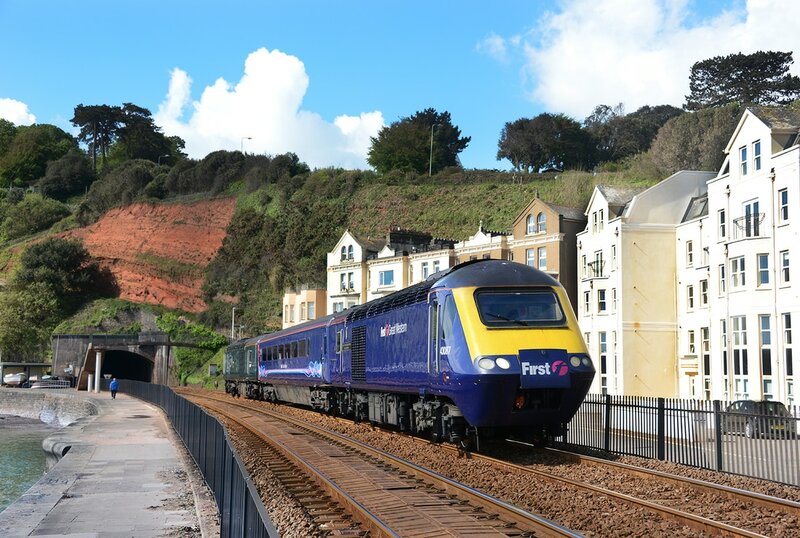 On the first day of 2017 operation, the westbound 17.50 Exeter St Davids to Penzance is seen pulling away from its Dawlish station stop and approaching Kennaway Tunnel powered by Class 57/6 No. 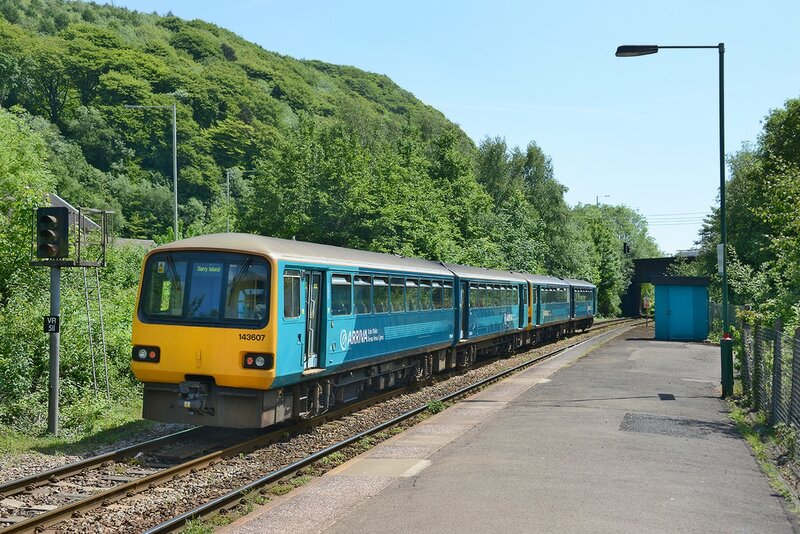 57603. 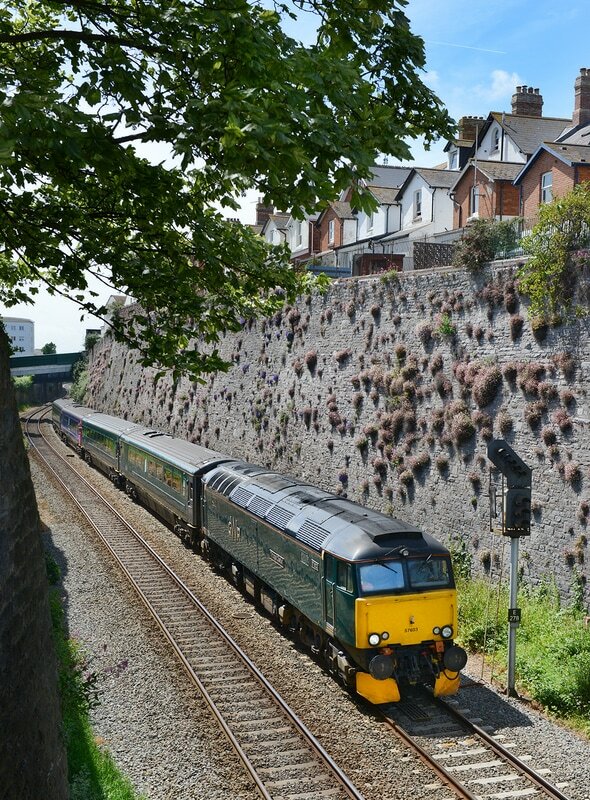 57603 approaches Teignmouth on 27 May 2017 powering the summer Saturday 13.35 Plymouth to Exeter St Davids loco-hauled service. 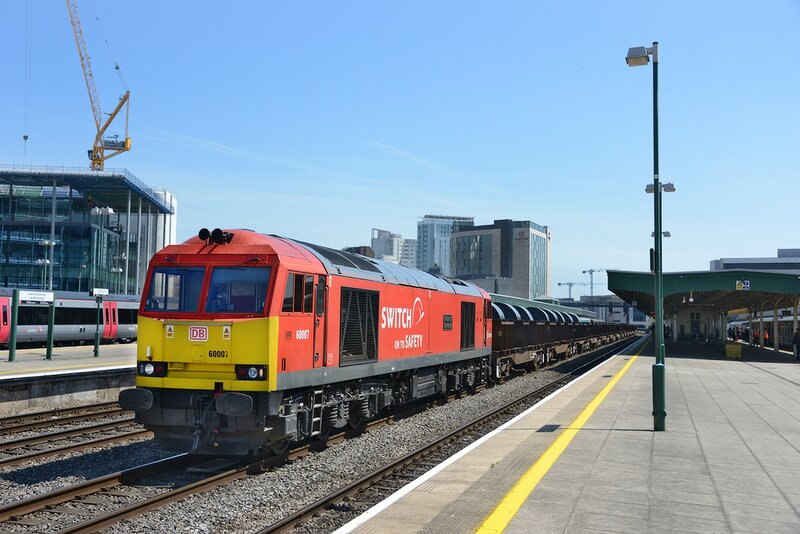 Second sunny freight on the Sea Wall in the same afternoon! 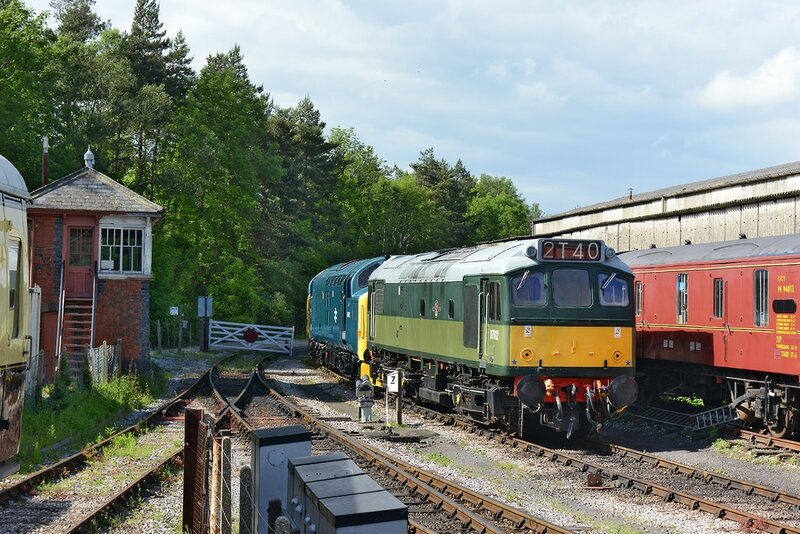 25 May 2017, 'odd ball' 66 No. 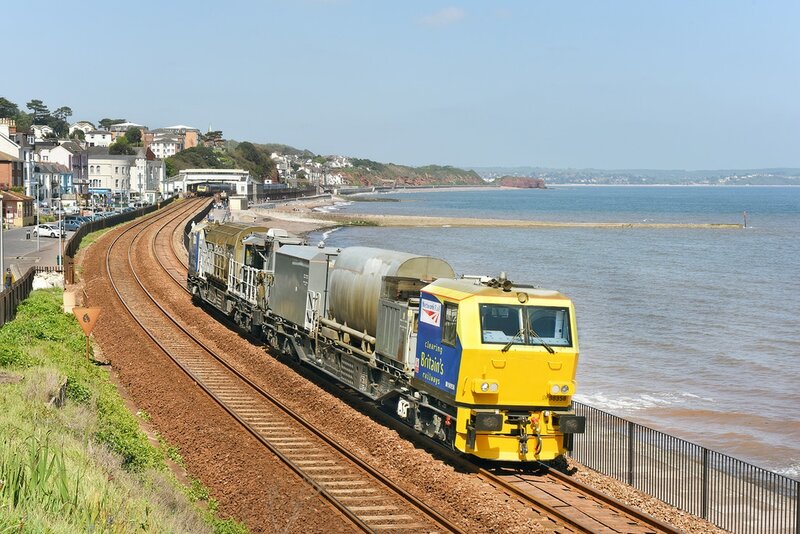 66001 passes adjacent to Marine Parade, Dawlish with 6C53, 15.06 St Blazey to Exeter Riverside loaded clay. 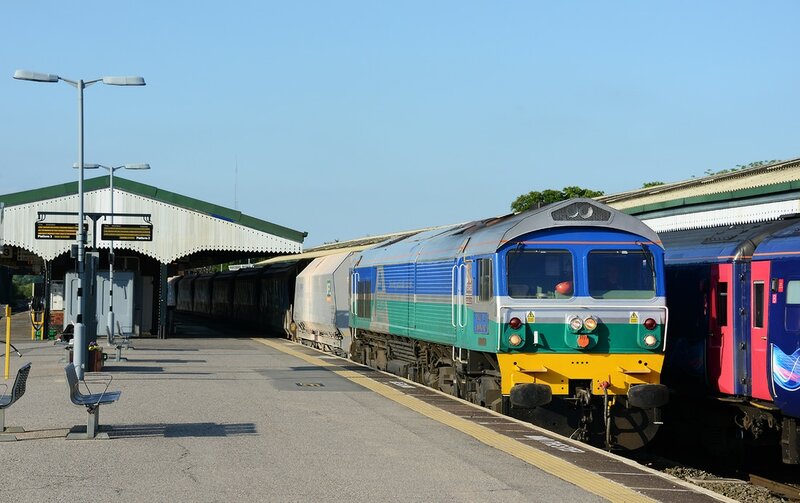 The sun still held out today - 25 May 2017 and was kind to allow this image to be recorded of 6C36, the 11.38 Moorswater to Aberthaw empty PCA wagons. Powered by new Colas Rail freight Class 70 No. 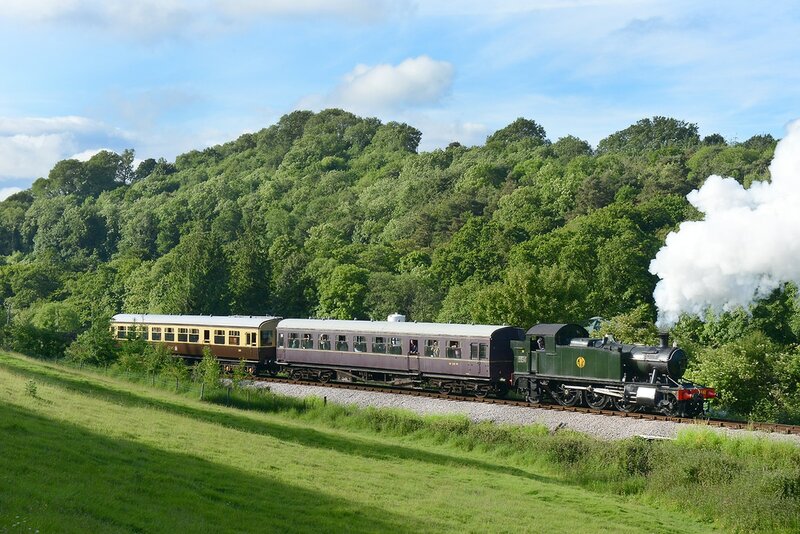 70812, the train is seen passing through the Powderham Estate alongside the River Exe. 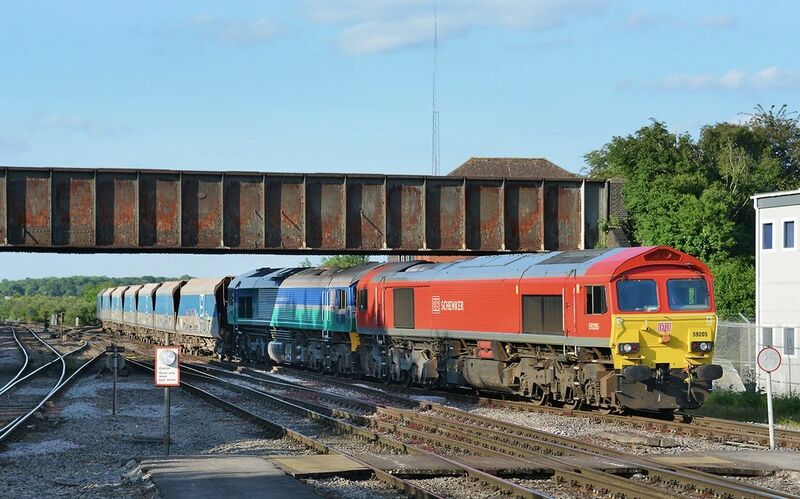 59004 passes through Westbury, 17.50 Wootton Bassett - Merehead Quarry, 24 May 2017. 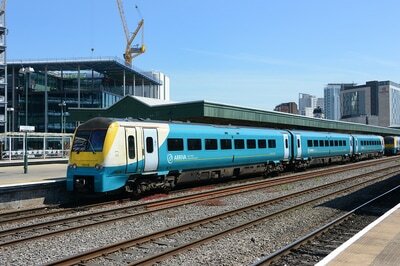 60007 pass Cardiff Central, 11.20 Llanwern Exchange Sidings - Margam yard. 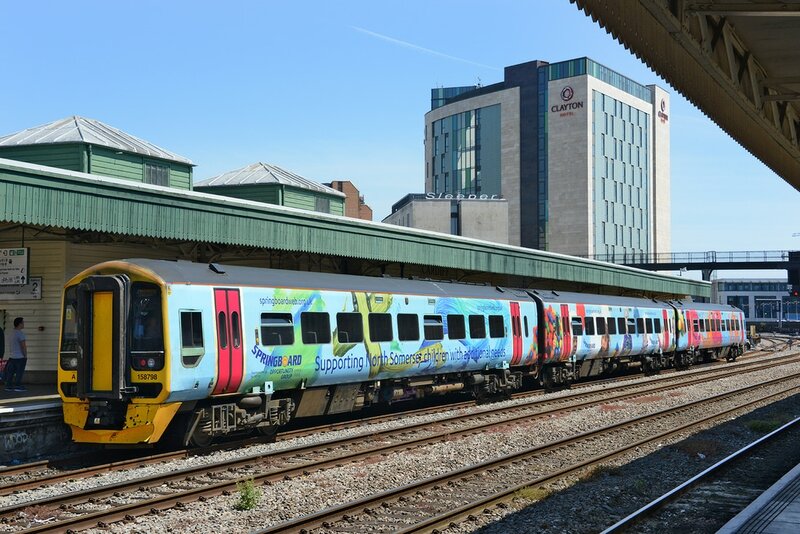 24 May 2017. 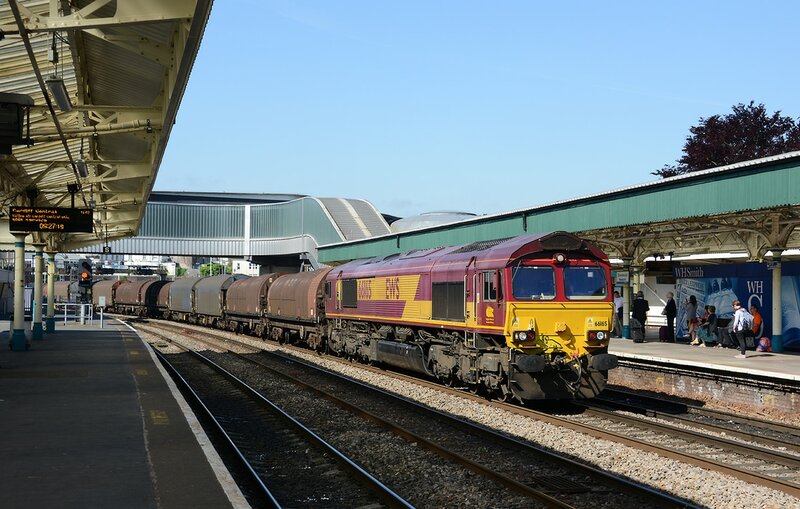 66040 down Newport, 10.48 East Usk Junction New Yard to Alexandra Dock Junction. 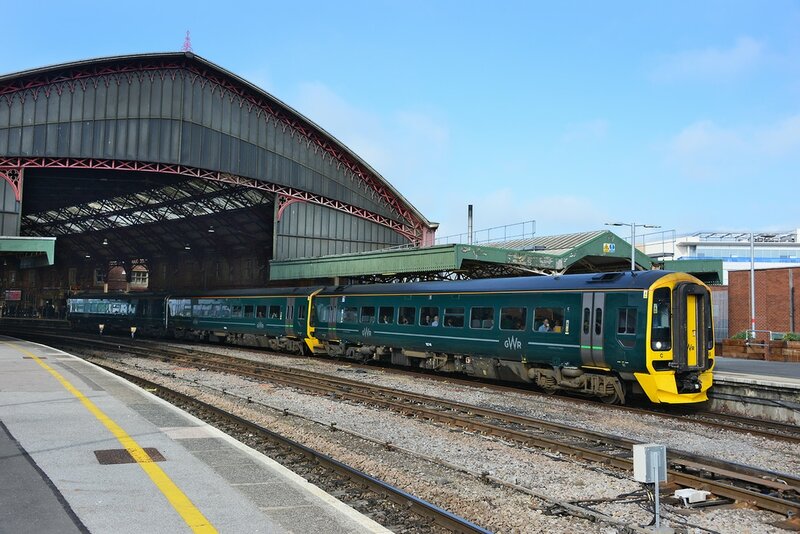 24 May 2017. 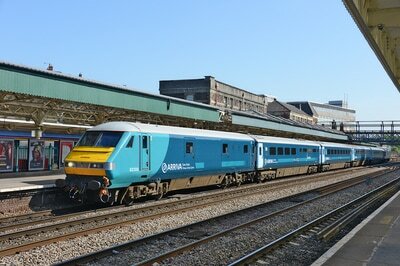 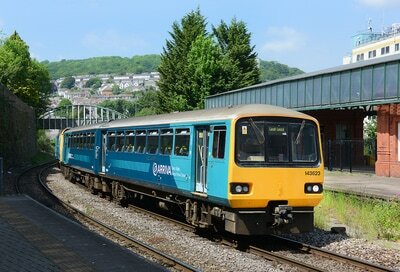 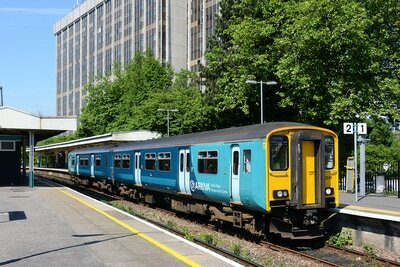 43002/-/43161 down Newport, 1B12, 08.15 Paddington - Cardiff. 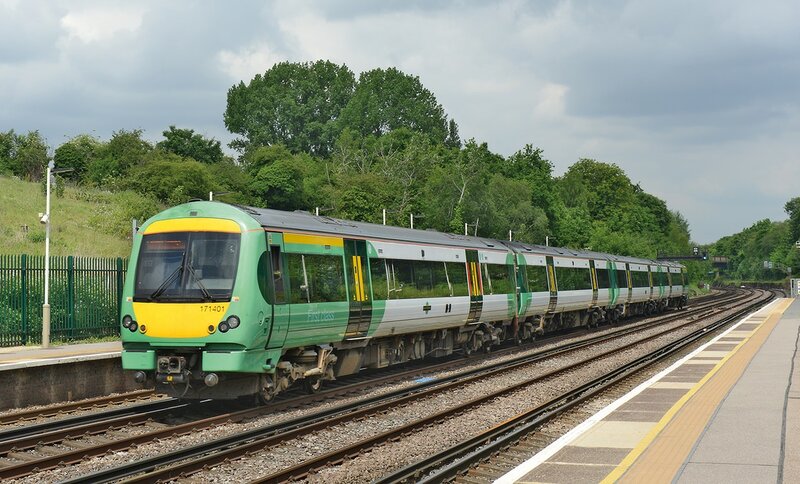 24 May 2017. 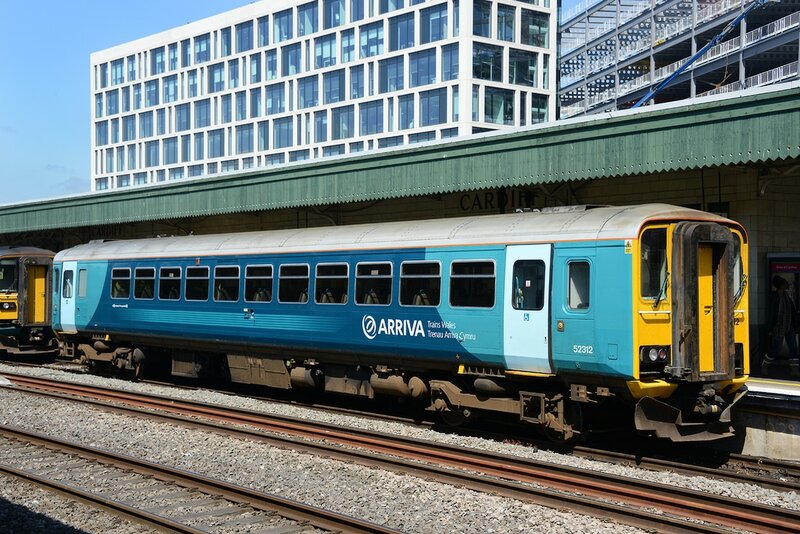 DVT82306/-/67029 down Newport, 1V91, 05.33 Holyhead - Cardiff Central. 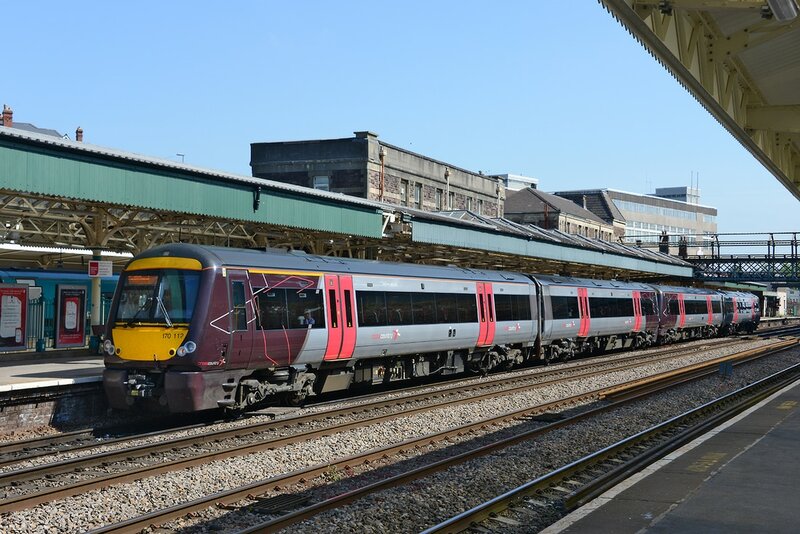 24 May 2017. 67029 Newport, 1V91, 05.33 Holyhead - Cardiff Central. 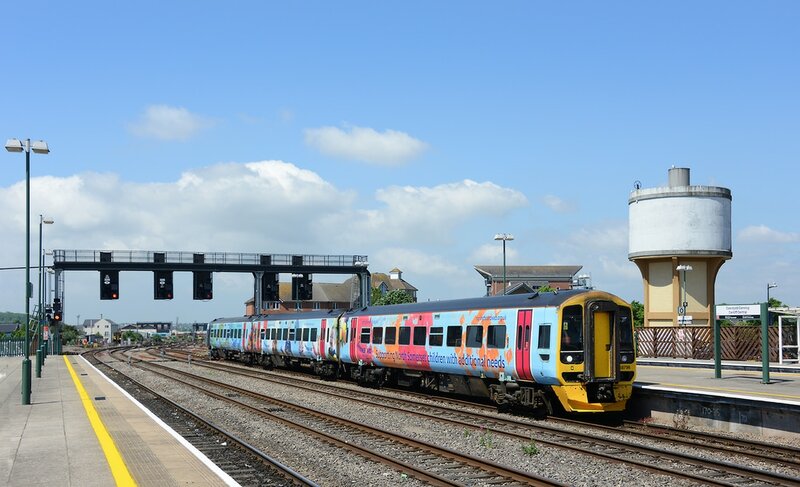 24 May 2017. 66165 up Newport, 07.34 Margam TC - East Usk Branch Birdport. 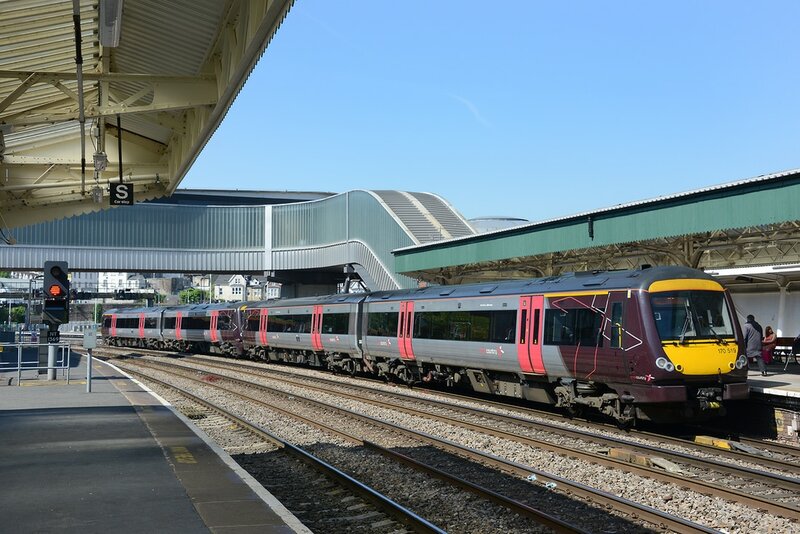 24 May 2017. 158957 dep Newport, 1F06 06.00 Portsmouth Harbour - Cardiff Central. 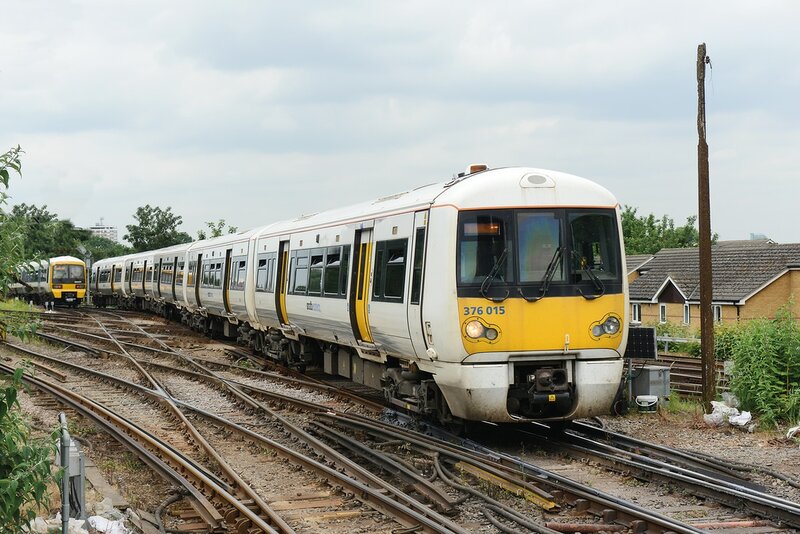 24 May 2017. 158956 arrive at Bristol TM, 2E17, 07.23 Warminster - Great Malvern. 24 May 2017. 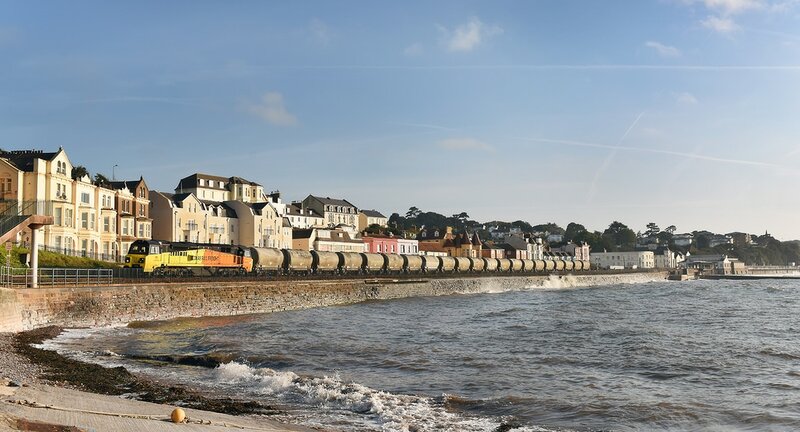 Another of the classic views of the Dawlish Sea Wall, including a Class 68 knocked off. In glorious afternoon light, DRS No. 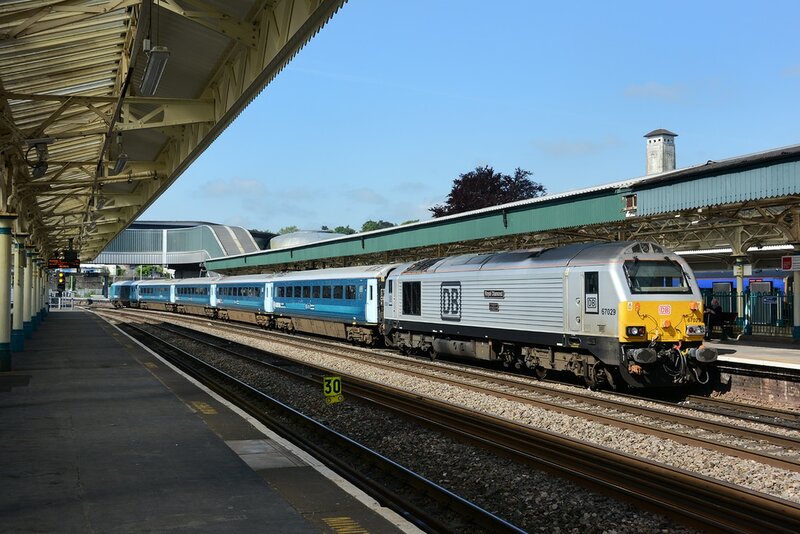 68002 leads the 'Posh-Nosh' Northern Bell return charter, 1Z68 12.35 Swindon to Swindon via Plymouth adjacent to Marine Parade, Dawlish on 21 May 2017. 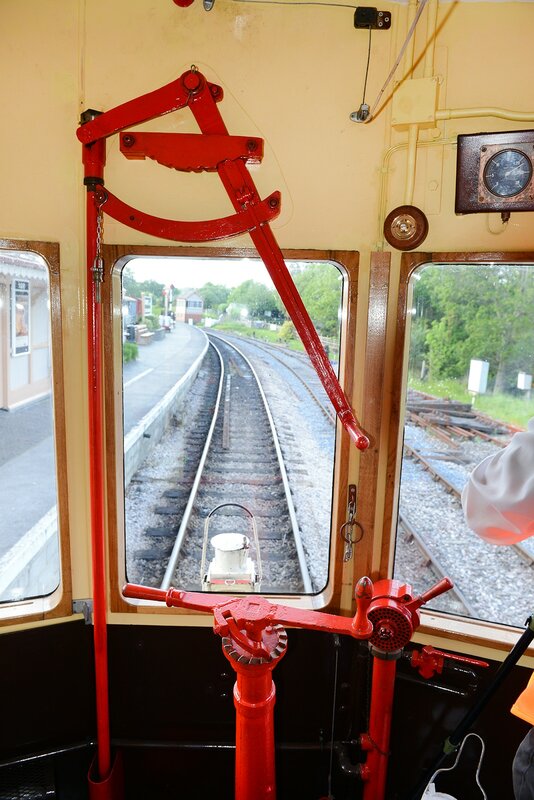 On the rear of the train is sister loco No. 68017. 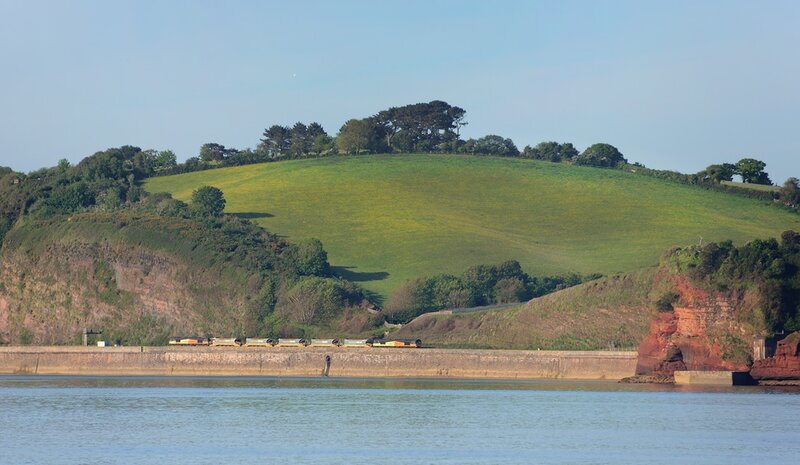 Well the sun still shines on Dawlish, allowing a rather pleasing image of the westbound Northern Bell approaching Kennaway Tunnel, Dawlish on 21 May 2017. 'Top and tailed' by DRS Class 68s Nos. 68017 and 68002. Lots of dark clag from 68017. 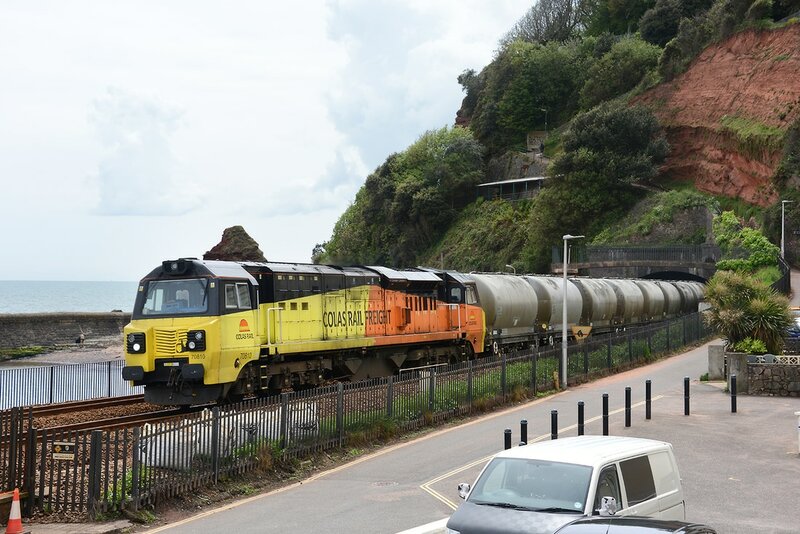 A superb sunny morning here in Dawlish today, 21 May 2017 and what do we have, the nice colourful Colas Rail Freight 'rag-head' Class 70 No. 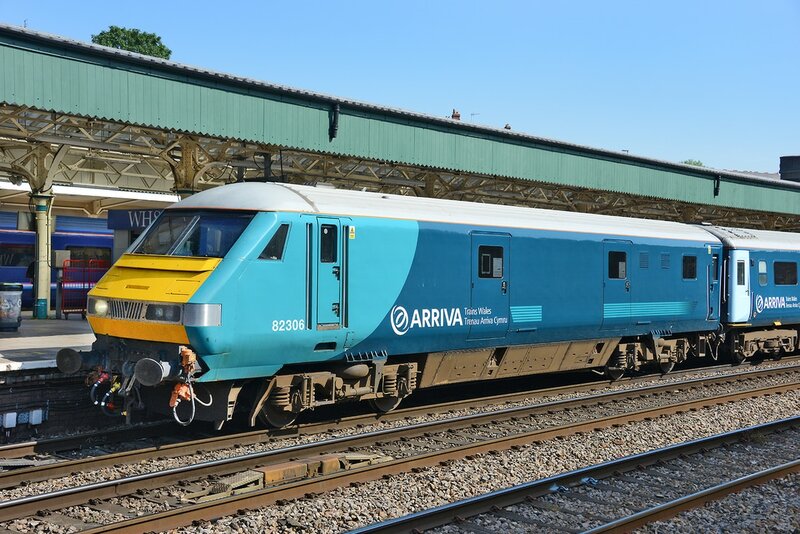 70801. 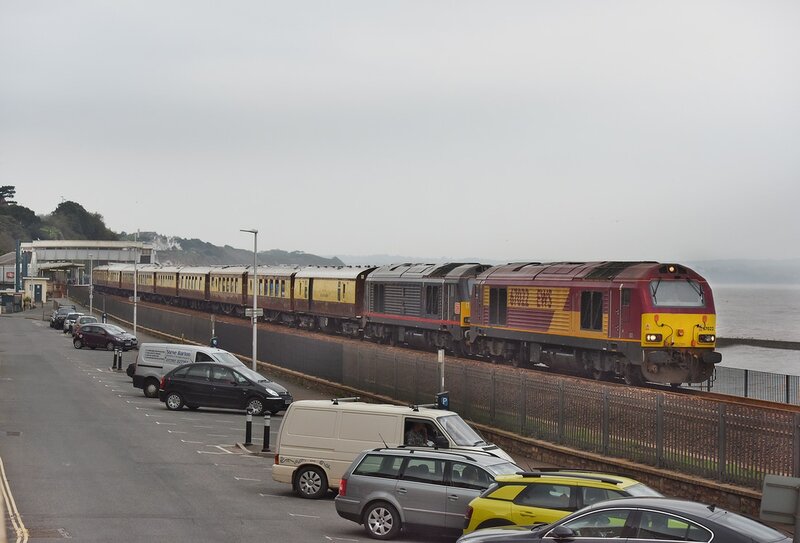 Seen starting to round the curve towards Dawlish Warren at Langstone Rock, the loco leads train 6C97, the 08.50 Par to Westbury, a part unloaded long welded rail train. 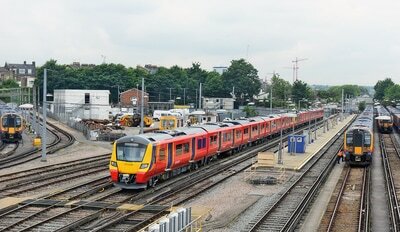 Note to photographers, some of the lower-level westbound views from Langstone Rock have now gone due to tree and bush growth. 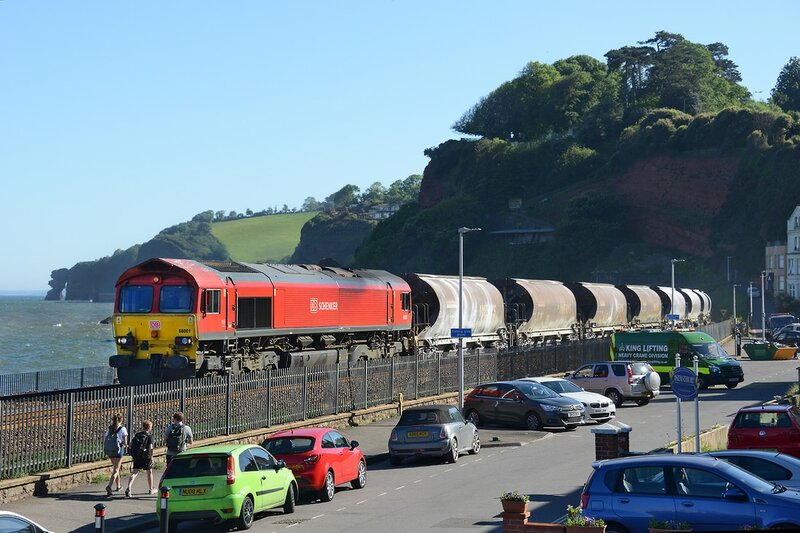 A superb sunny morning here in Dawlish today, 21 May 2017 and what do we have, the nice colourful Colas Rail Freight 'rag-head' Class 70 No. 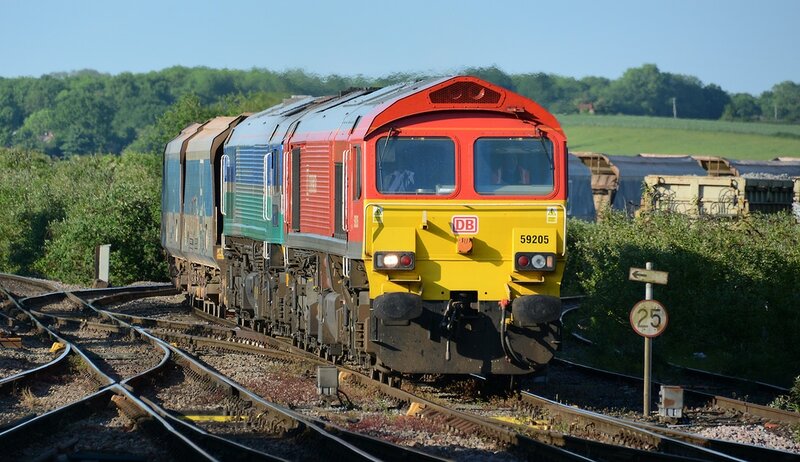 70801. 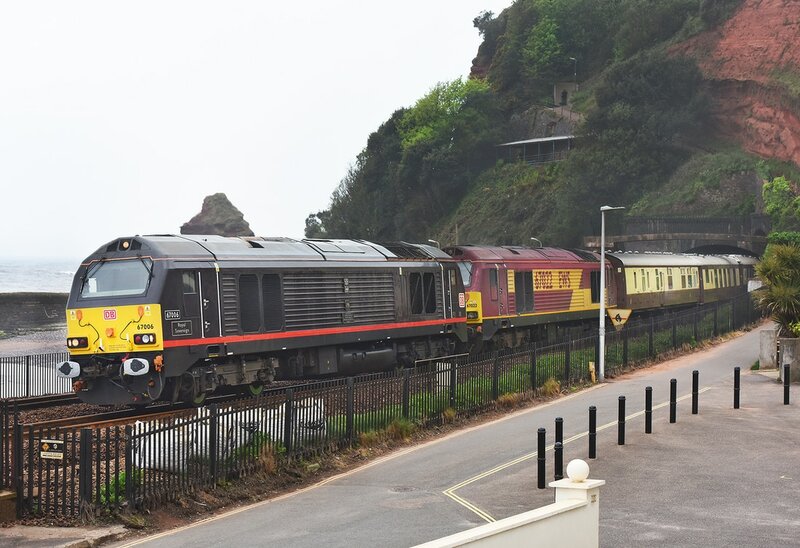 Seem emerging from Kennaway Tunnel, Dawlish, the loco leads train 6C97, the 08.50 Par to Westbury, a part unloaded long welded rail train. 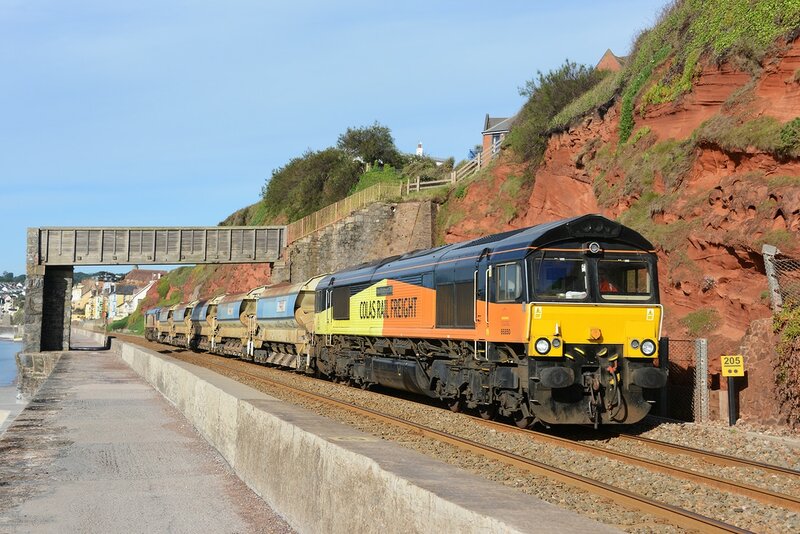 A superb sunny morning here in Dawlish today, 21 May 2017 and what do we have, the nice colourful Colas Rail Freight 'rag-head' Class 70 No. 70801. 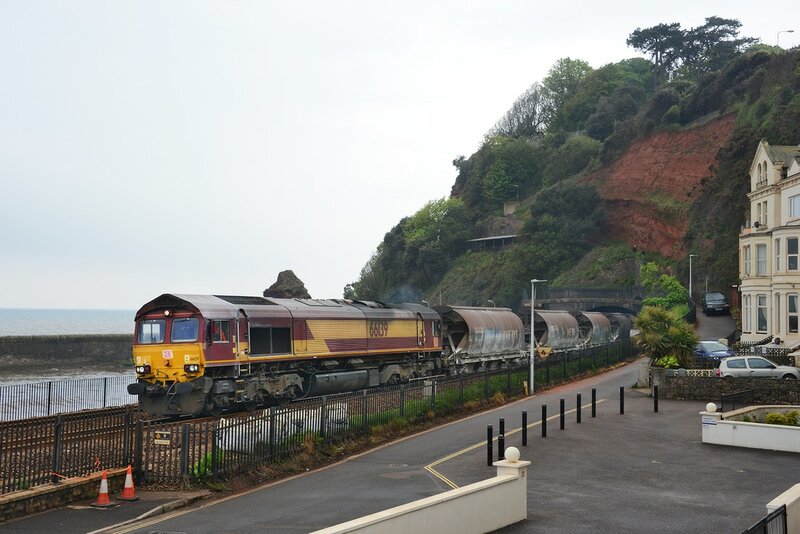 Seem emerging from Parsons Tunnel, between Teignmouth and Dawlish, the loco leads train 6C97, the 08.50 Par to Westbury, a part unloaded long welded rail train. 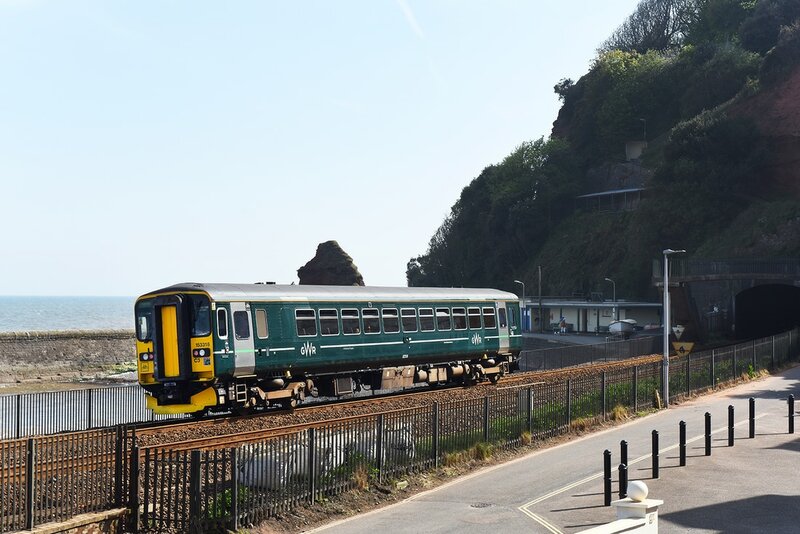 143612 passes along the Dawlish Sea Wall approaching Dawlish Warren on 21 May 2017 forming the 09.49 Paignton to Exmouth. 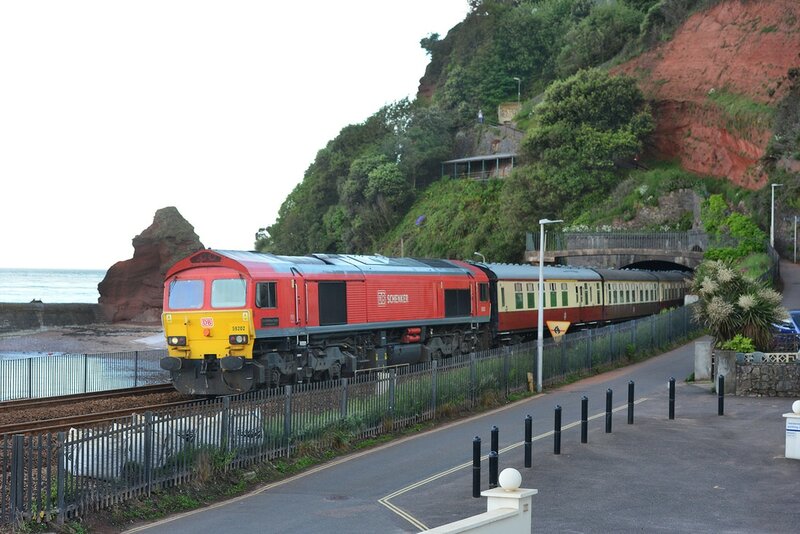 Pity about the light when we get a mid afternoon freight passing Dawlish. 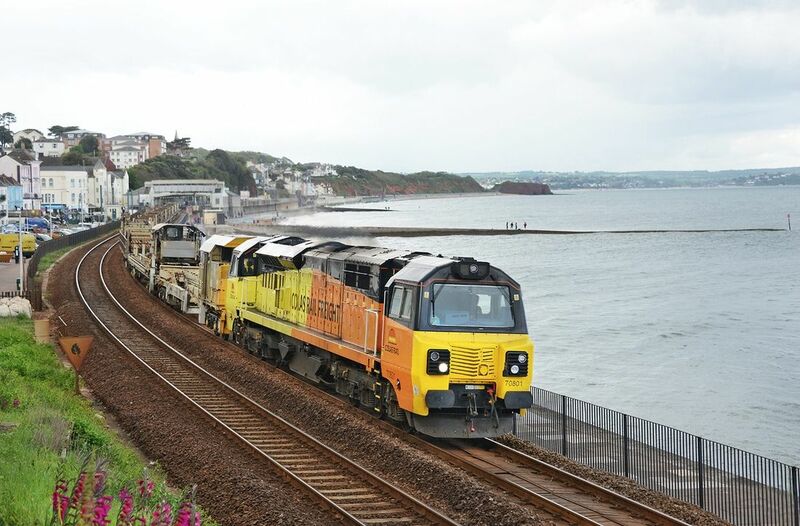 But so be.... Colas Rail Freight Class 70 No. 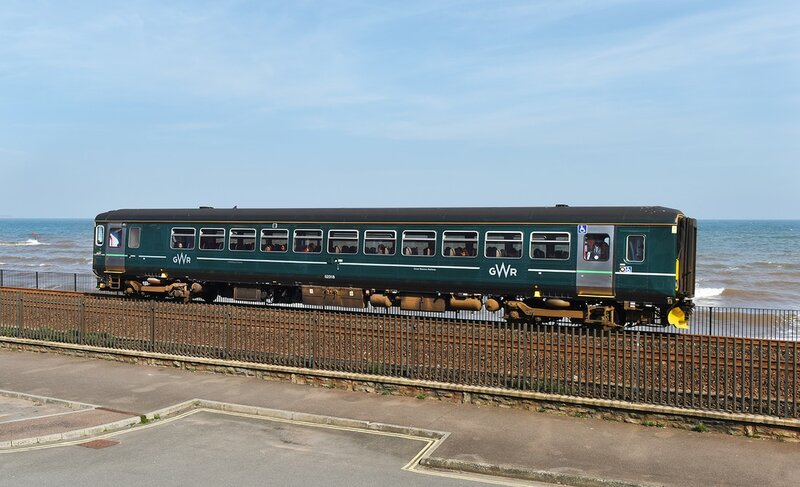 70801 passes Dawlish heading towards Kennaway Tunnel on 20 May 2017 powering long welded rail train 6C97, 13.29 Westbury to St Austell. 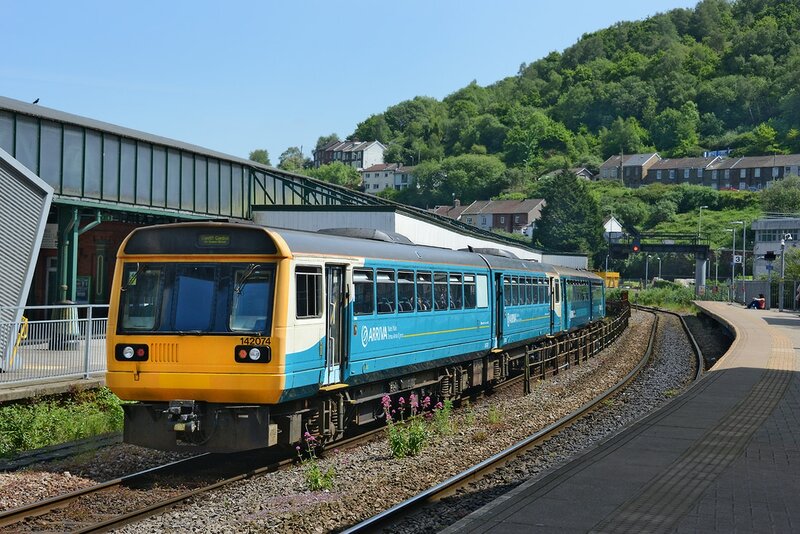 With the higher summer sun now illuminating the landward side of the line by Kennaway Tunnel, Dawlish in the early afternoon, some pleasing light fell on the up 6C36, 11.25 Moorswater to Aberthaw empty cement on 18 May 2017. 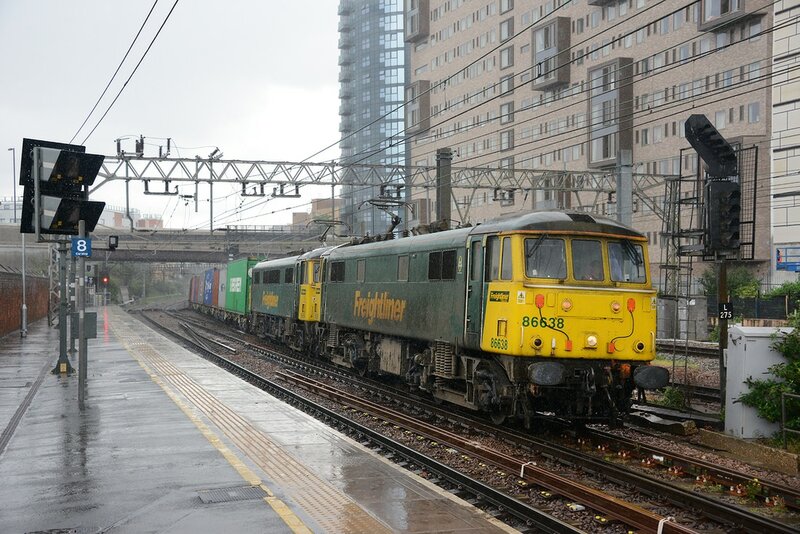 Power was provided by Colas Rail Freight Class 70 No. 70810. 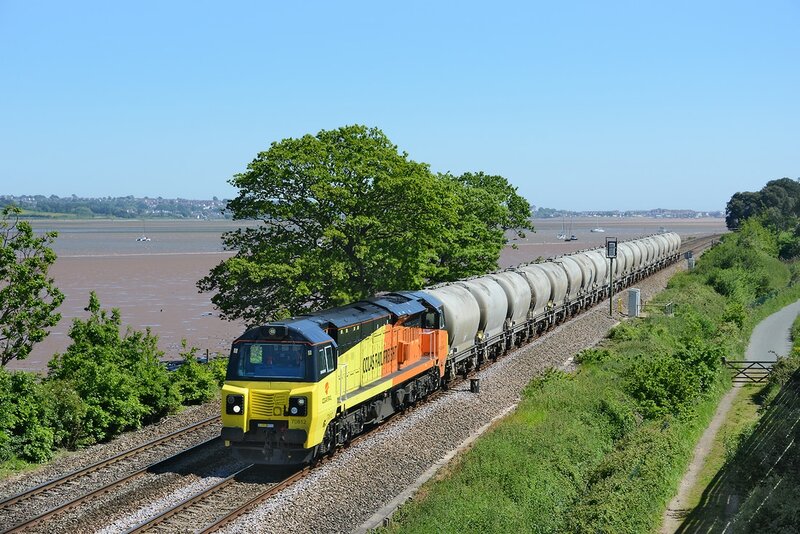 Colas Rail Freight Class 66s Nos. 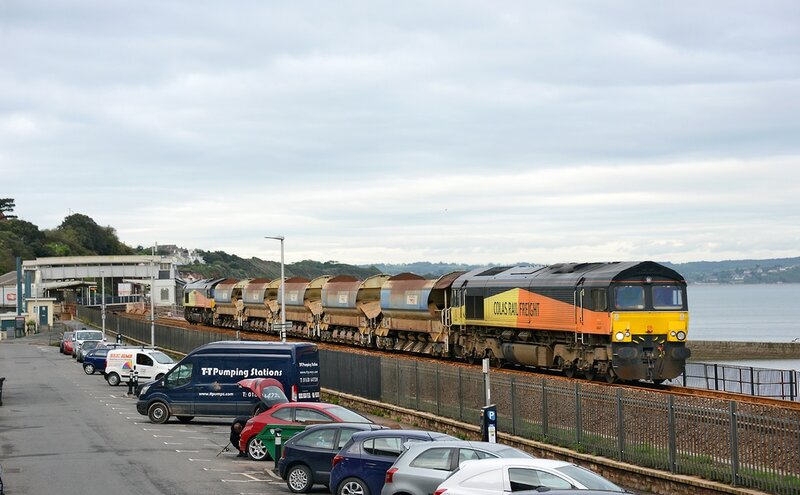 66850 and 66847 'top and tail' a five vehicle autoballaster set passing below Black Bridge (Rockstone) Dawlish during the early morning of 18 May 2017 forming train 6C22, the 04.56 Falmouth Docks to Westbuy. 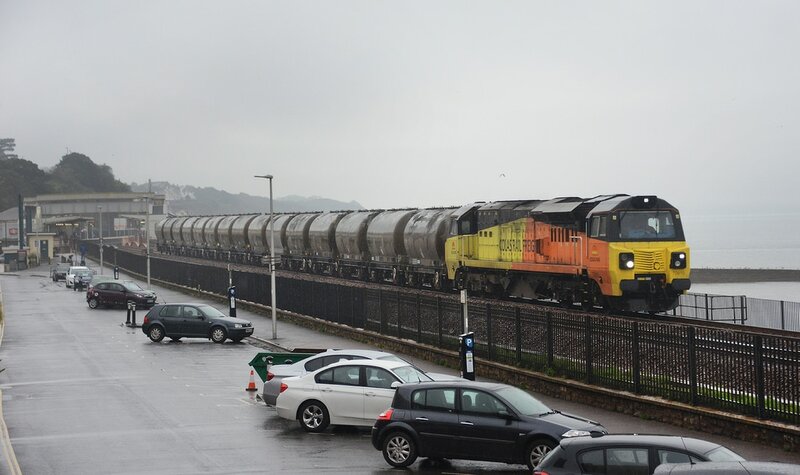 Colas Rail Freight Class 66s Nos. 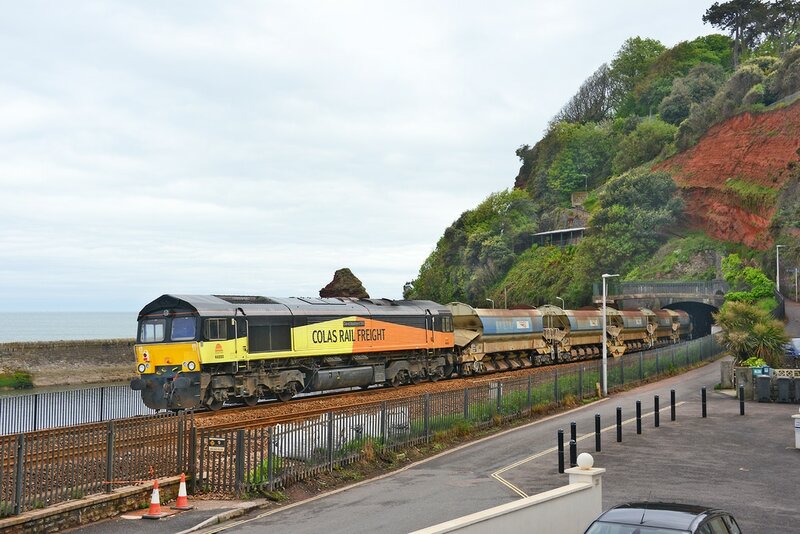 66850 and 66847 'top and tail' a five vehicle autoballaster set passing through the tunnel section approaching Dawlish during the early morning of 18 May 2017 forming train 6C22, the 04.56 Falmouth Docks to Westbuy. 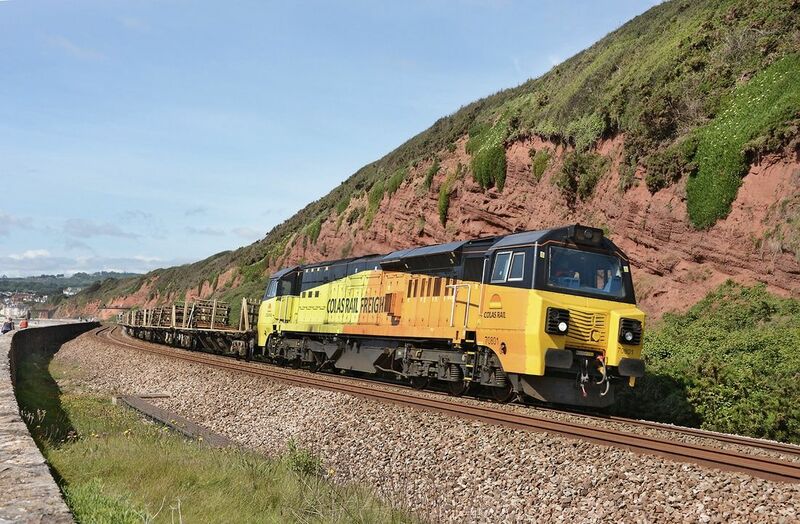 Colas Class 66s Nos. 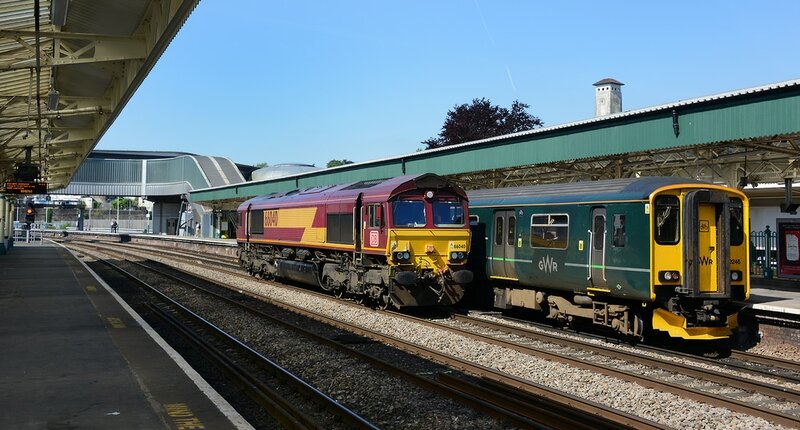 66847 and 66850 'top and tail' a five vehicle autoballaster set through Dawlish during the mid evening of 17 May 2017 forming train 6C22, the 16.35 Westbury to Falmouth Docks. 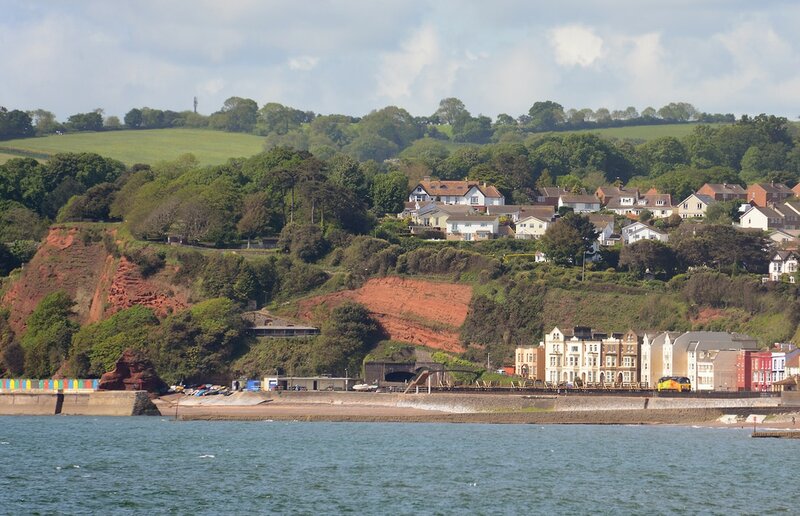 Welcome to the summer in Dawlish! 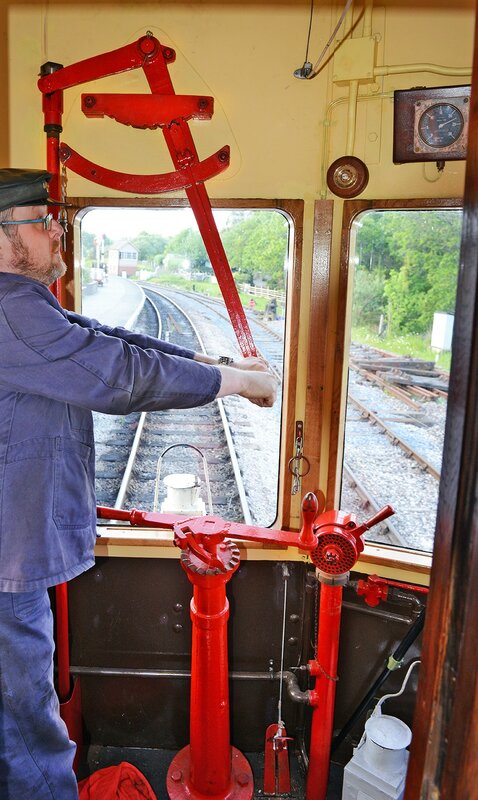 Dull, rain and sticky. 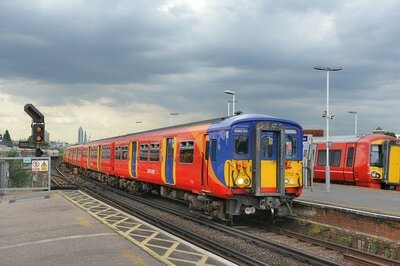 The only thing to brighten the day is a passing Colas Rail Freight Class 70 No. 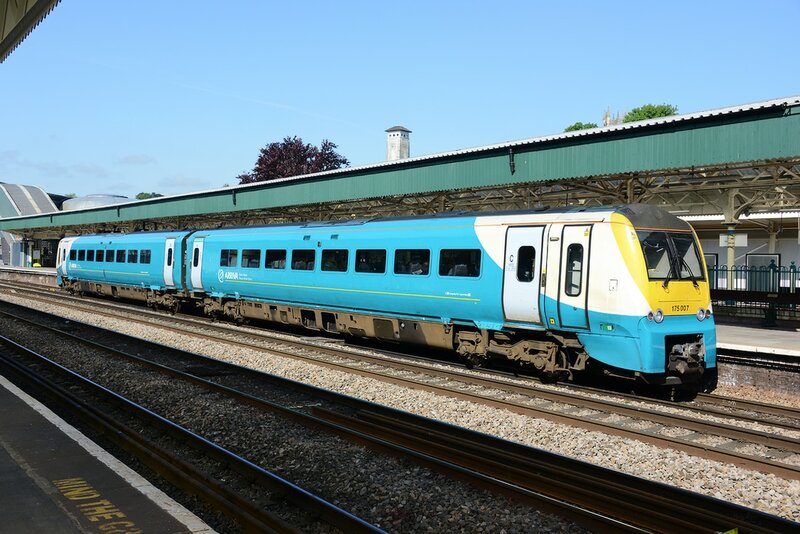 70810 powering 6C35, the 02.50 Aberthaw to Moorswater on 17 May 2017. Seen heading towards Kennaway Tunnel. Pioneer production power car No. 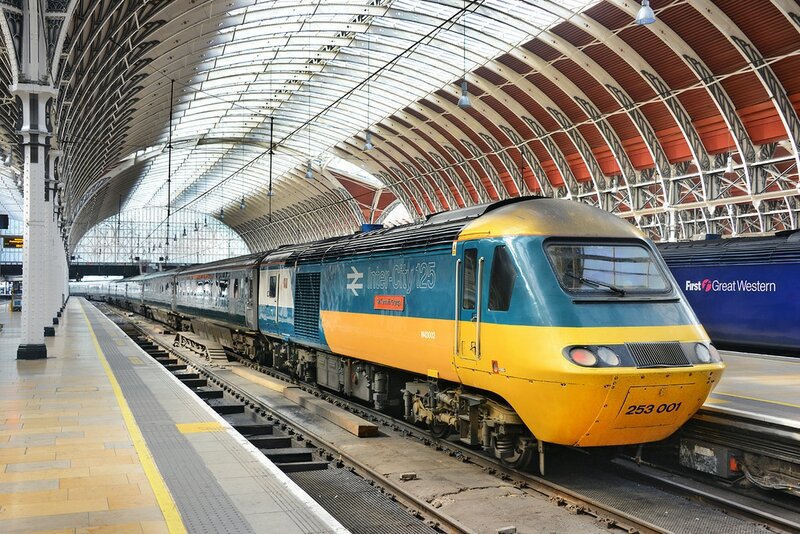 43002, restored to 1970s blue and yellow livery, sits below the great Brunel roof at Paddington on 12 May 2017, after arrival with the 13.55 Cardiff to Paddington, the set then formed train1C22, the 16.33 Paddington to Taunton. Even with a 'glint' of light to lift the dull WCRC livery, Class 57/3 No. 57316 leads the return Statesman charter out of Kennaway Tunnel, Dawlish on 13 May 2017. The train was running as 1Z85, 16.40 Paignton to Crewe. An interesting short HST run took place on 13 May 2017 when Class 43 No. 43087, TGS No. 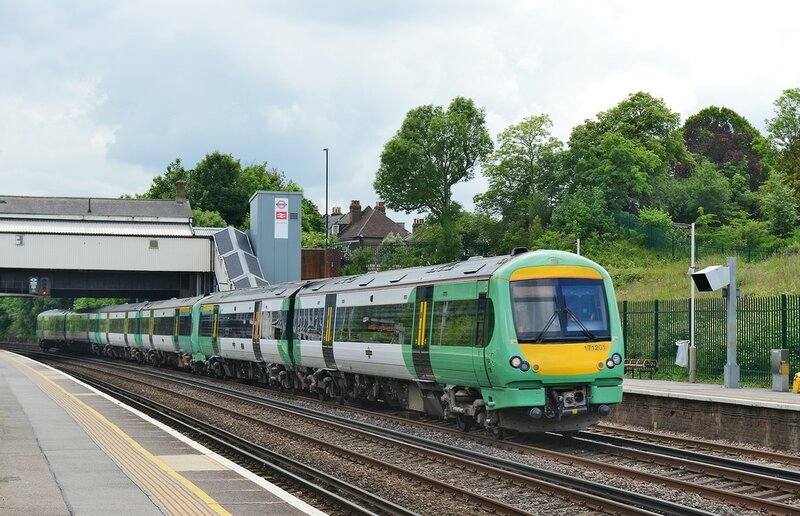 44000 and green-liveried Class 43 No. 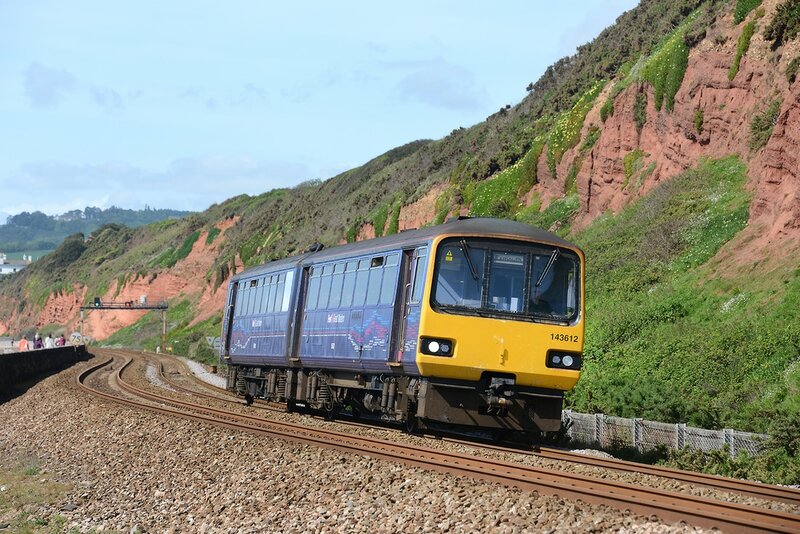 43187 operated as train 5Z74, the 09.30 Laira to Bristol SPM, seen emerging from Kennaway Tunnel, Dawlish. Note the front coupling cover is open. 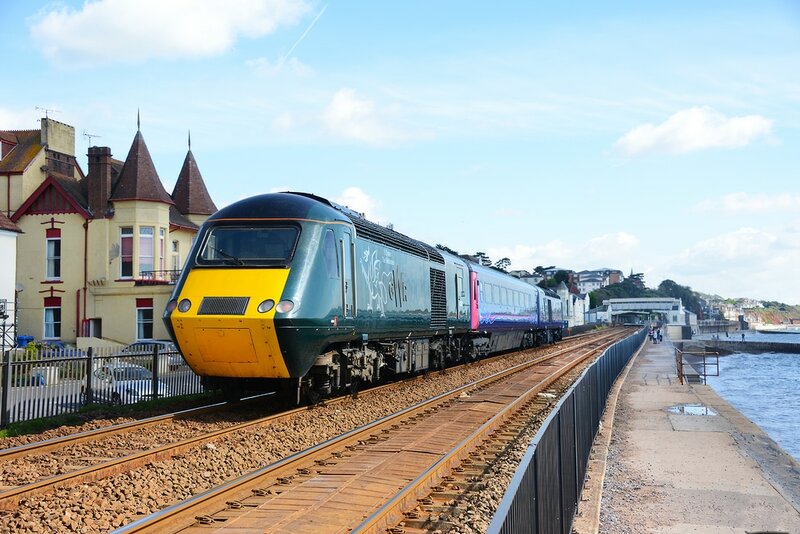 An interesting short HST run took place on 13 May 2017 when Class 43 No. 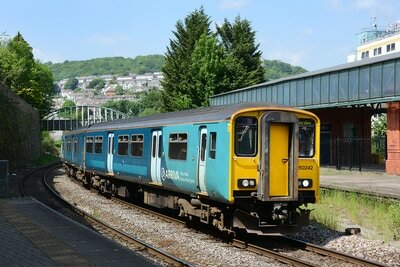 43087, TGS No. 44000 and green-liveried Class 43 No. 43187 operated as train 5Z74, the 09.30 Laira to Bristol SPM, seen emerging from Kennaway Tunnel, Dawlish. 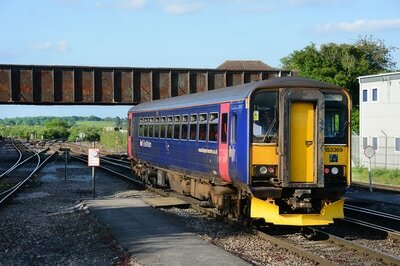 Well, one out of two charters in sun is OK I guess for Dawlish. 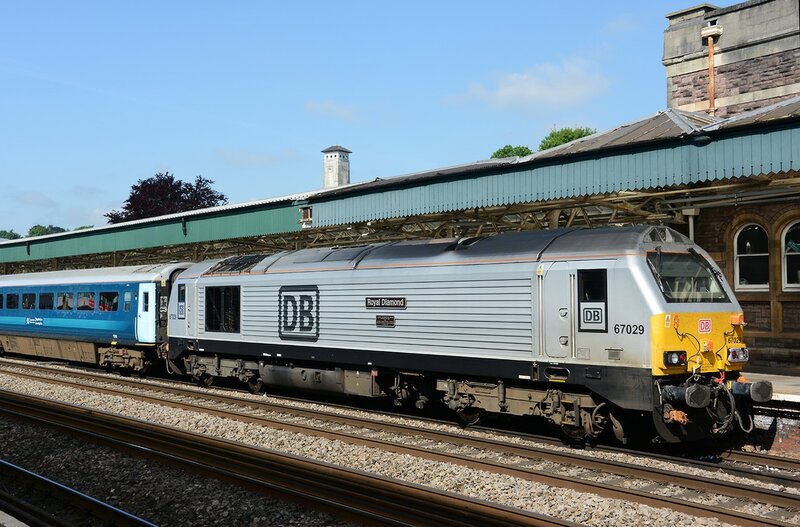 On Saturday 13 May 2017, DB-C provided the power and staff for 'The Torbay Flyer' 1Z14, 06.41 Letchworth to Paignton. 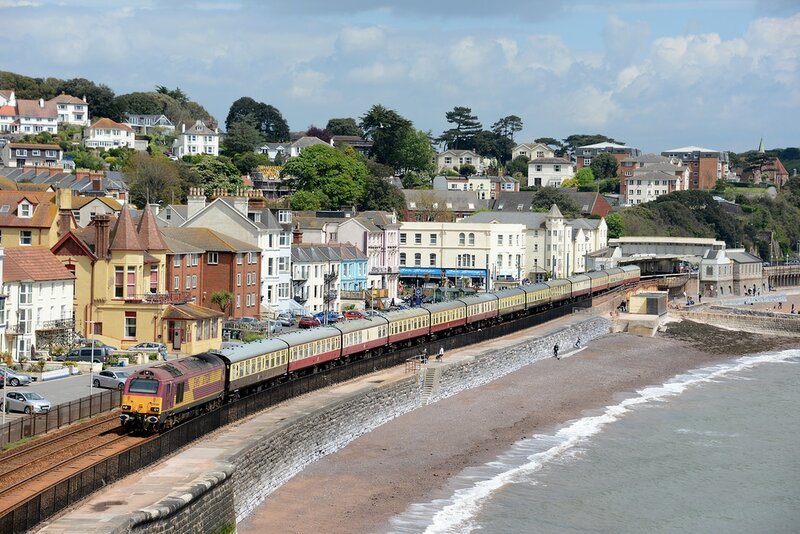 Seen skirting King's Walk, Dawlish. 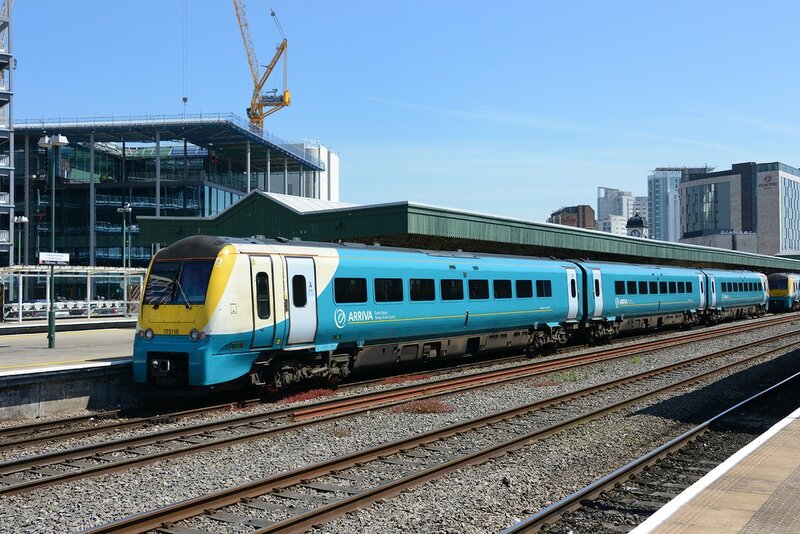 For those who don't know, this view is about to slightly change, with the removal of the old ice cream cafe on the walkway adjacent to The Viaduct. Network Rail have applied for permission to remove the structure to enable sea wall work to be undertaken. 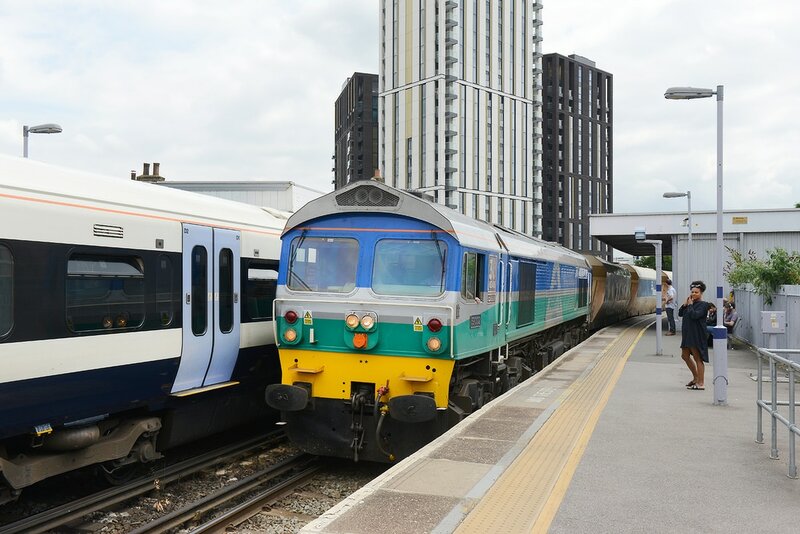 These days there seems to be a reduced number of Class 86 duties on the Great Eastern route, powering Freightliner traffic. On 12 May 2017, Class 86/6s Nos. 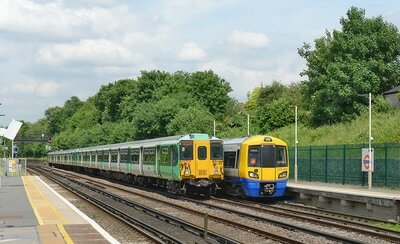 86638 and 86604 are seen working in multiple powering train 4M87, the 11.13 Felixstowe to Manchester Traffird Park. 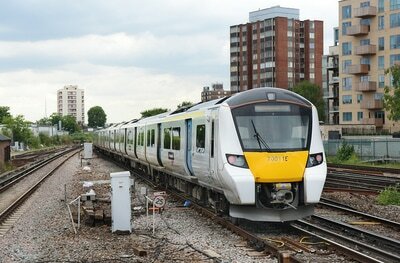 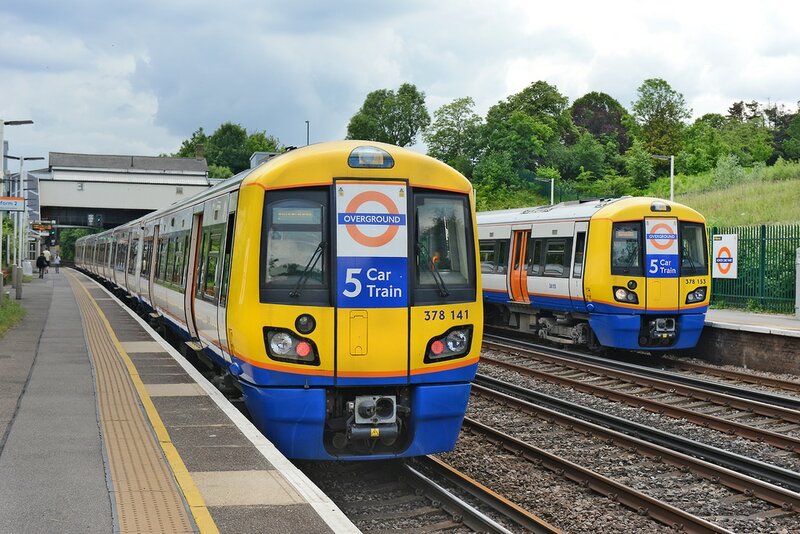 The train is seen approaching Stratford station in East London before heading via the North London line to reach the West Coast Main Line and head north. 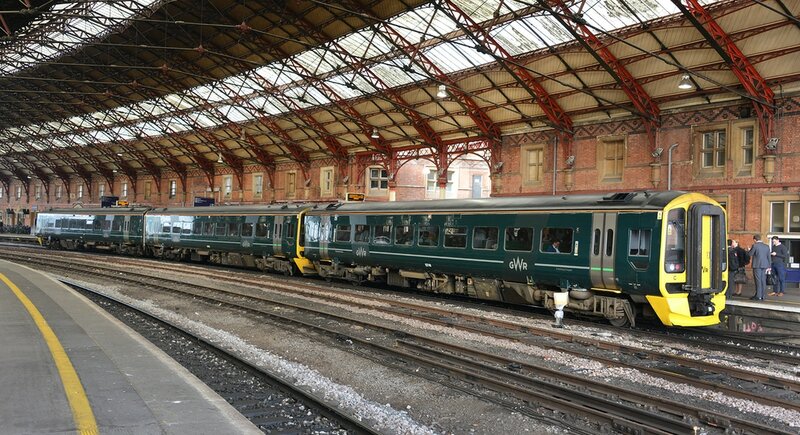 GWR green liveried Class 153 No. 153318 passes Dawlish on 10 May 2017 forming the 15.50 Exeter St Davids to Plymouth. 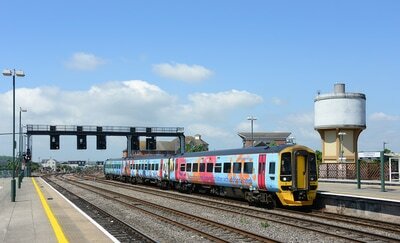 A sunny Wednesday morning in Dawlish can only mean one thing! 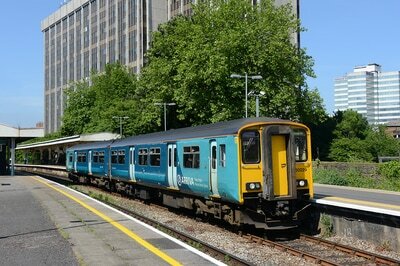 Get the down Aberthaw to Moorswater cement. 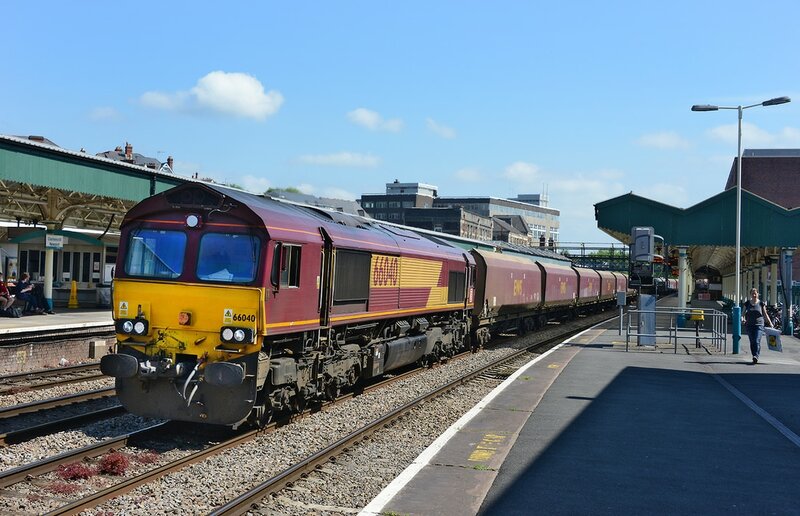 Running 91 mins early, 6C35, the 02.50 Aberthaw to Moorswater skirts King's Walk, Dawlish on 10 May 2017 powered by Colas Rail Freight Class 70 No. 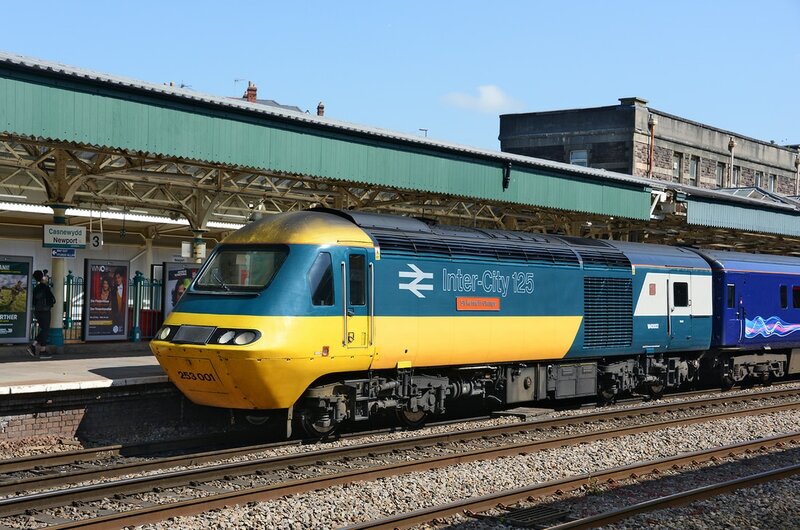 70810. 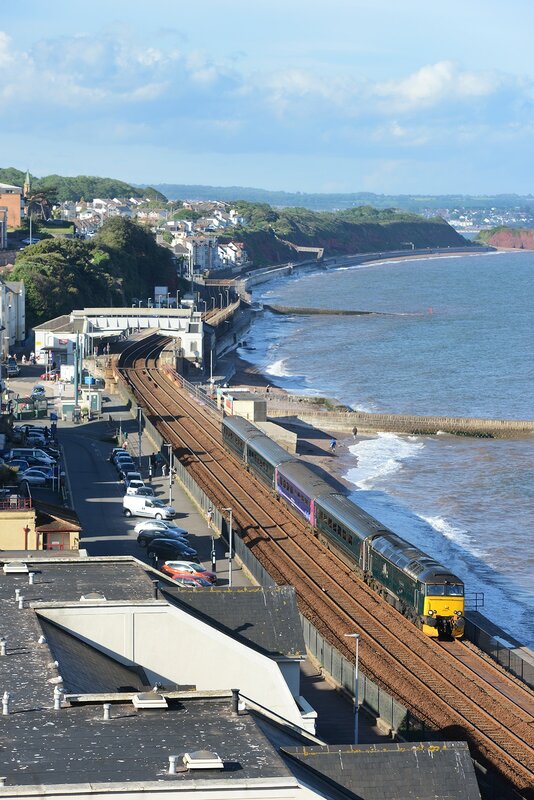 Don't get a lot of MPVs on the Dawlish Sea Wall, usually around once a year when its weed control time. 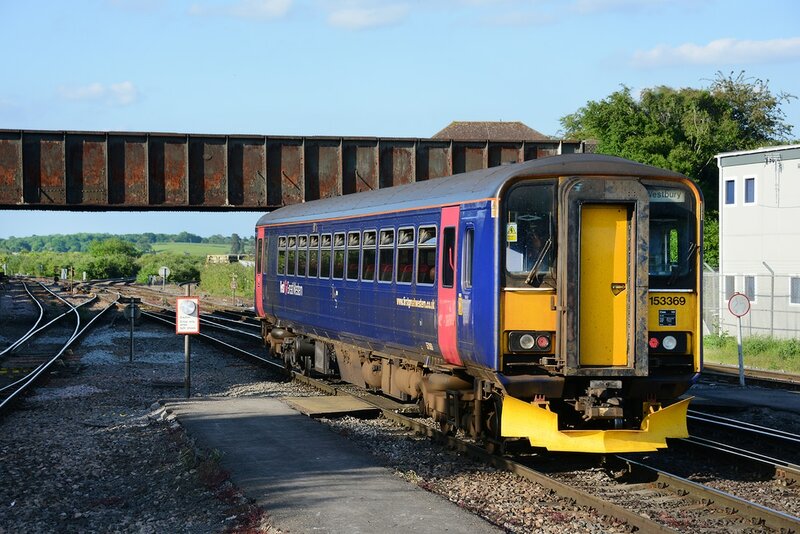 On 8 May 2017 we had a west bound daytime transit move of the weed control set formed 98958 and 98908 running as 6Z05, 15.00 Exeter Yard to St Blazey. 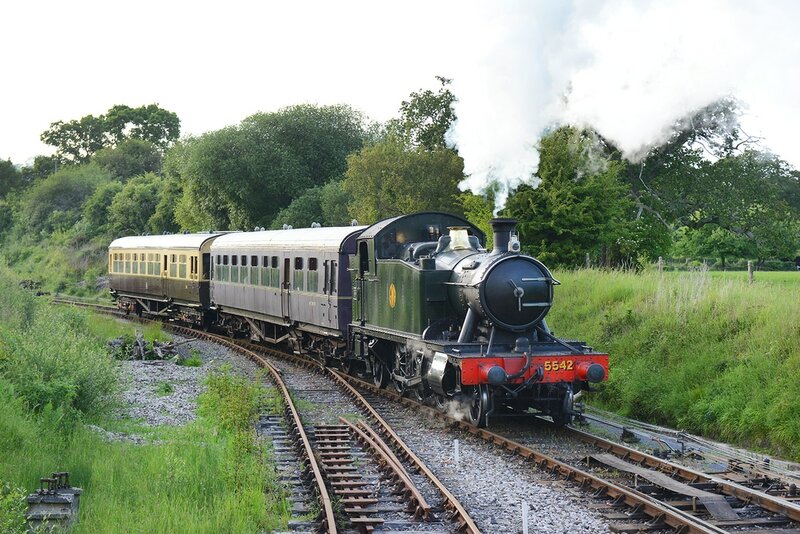 Seen approaching Kennaway Tunnel. 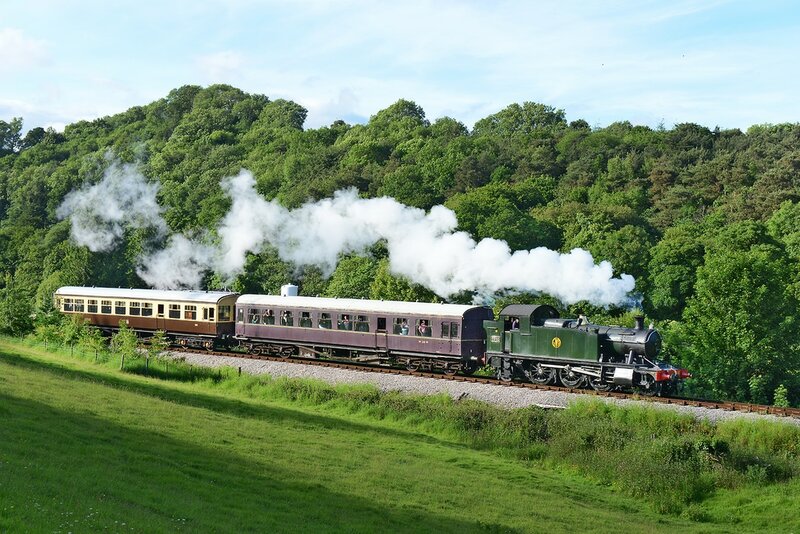 After complaining to the provider of the weather yesterday for the steam on the Sea Wall, the good man gave me 90% sun for todays return working of Great Britain X. 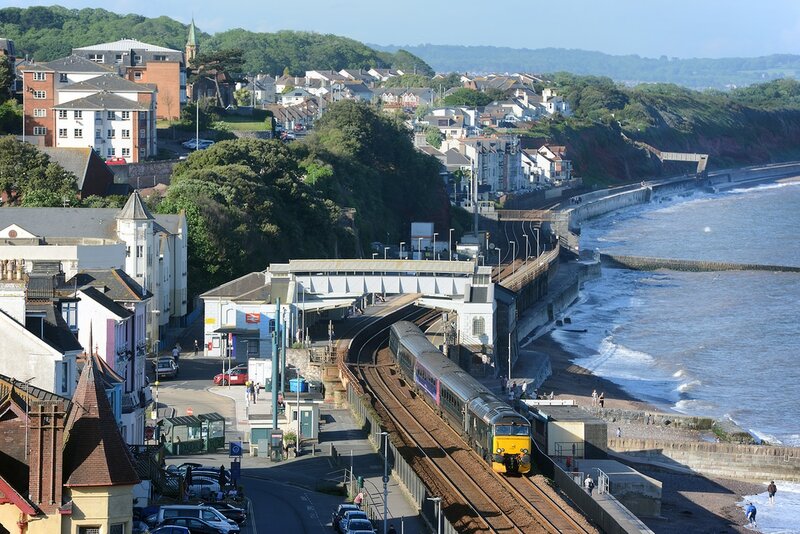 Approaching Dawlish station from Kennaway Tunnel and skirting Marine Parade, Bulleid No. 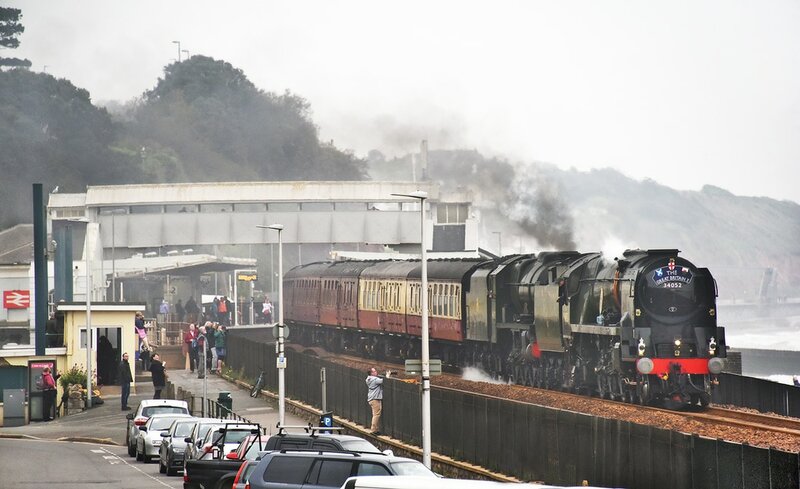 34052 'Lord Dowding' and 'Royal Scot' No. 46100 'Royal Scot' power train 1Z46, the 08.53 Penzance to Exeter St Davids. 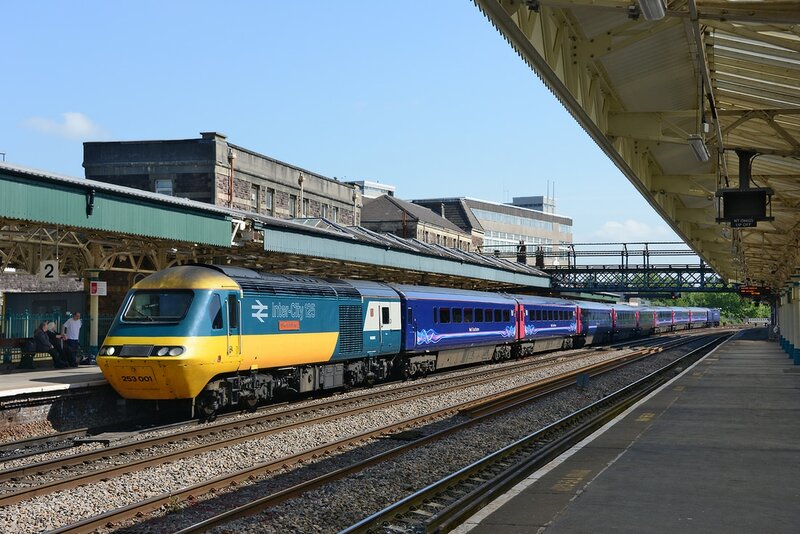 On 6 May 2017, 1Z80, 17.30 Bath Spa to Penzance, return VSOE charter, powered by Class 67s Nos. 67022 and 67006. 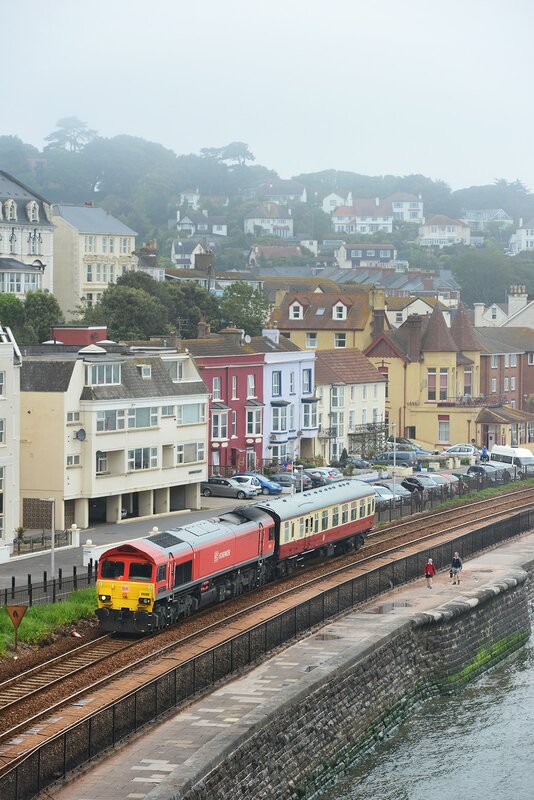 The train is seen passing Dawlish, heading towards Kennaway Tunnel, recorded thanks to high ISO availability. 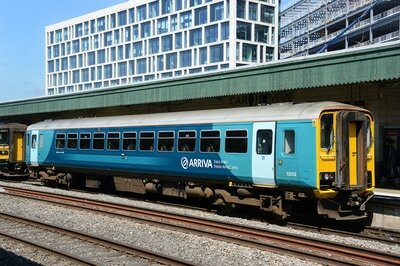 Royal-liveried Class 67 No. 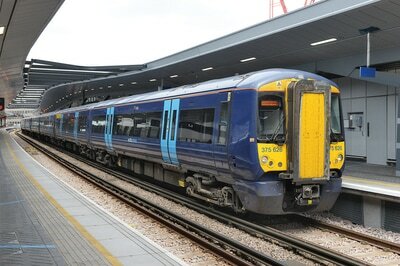 67006 pilots EWS liveried No. 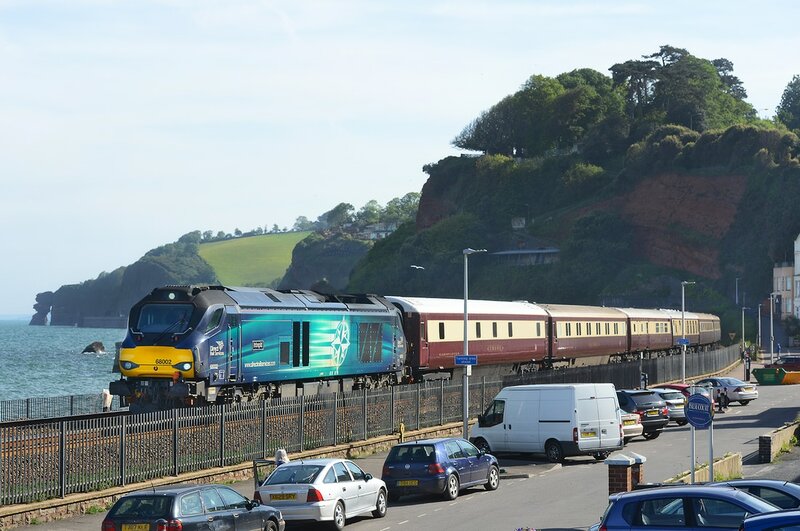 67022 out of Kennaway Tunnel, Dawlish on 6 May 2017 powering the VSOE Pullman rake as train 1Z79, the 09.10 penzance to Bath Spa. 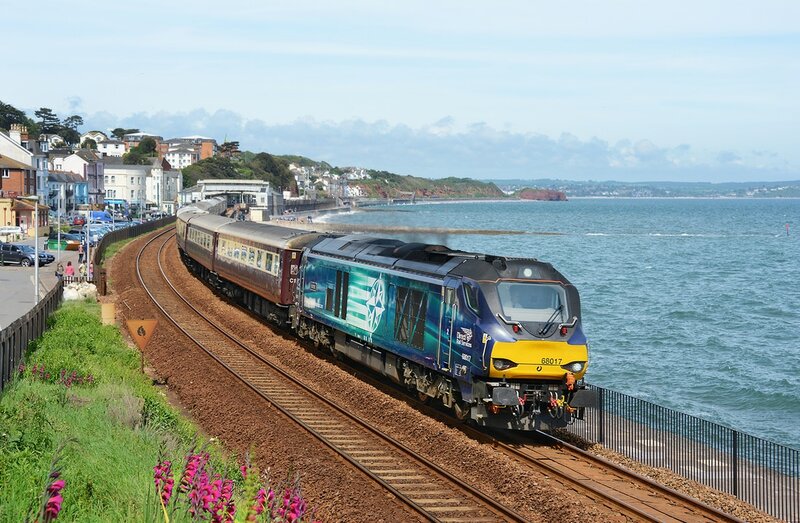 In stunning Devon summer weather, the Great Britain X tour is seen creeping past Dawlish on 6 May 2017. Running as train 1Z46, the 08.08 Bristol Temple Meads to Plymouth, the train is powered by Bulleid No. 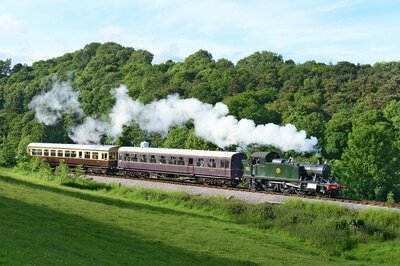 34052 'Lord Dowding' and LMS 'Royal Scot' No. 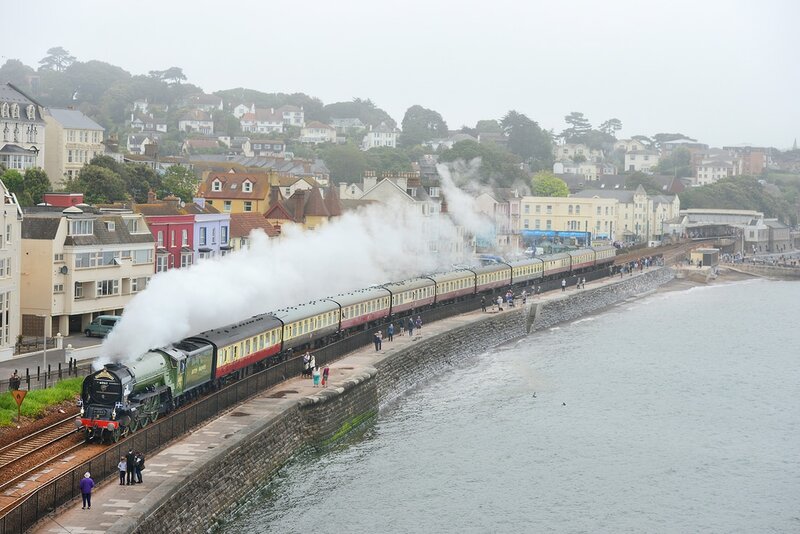 46100 'Royal Scot'. 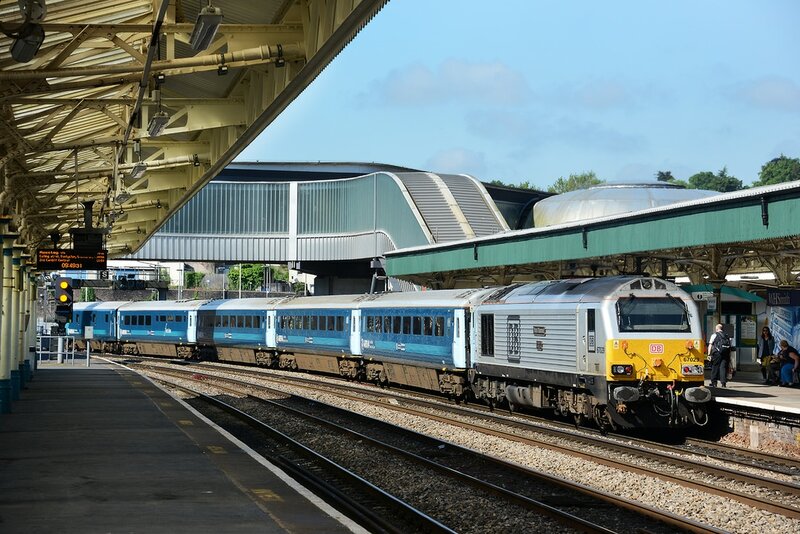 67022 and 67006 pass Dawlish on 5 May 2017 powering the VSOE Pullman operating as train 1Z78, 09.48 London Victoria to Truro.